Part I: Vision & Goals. 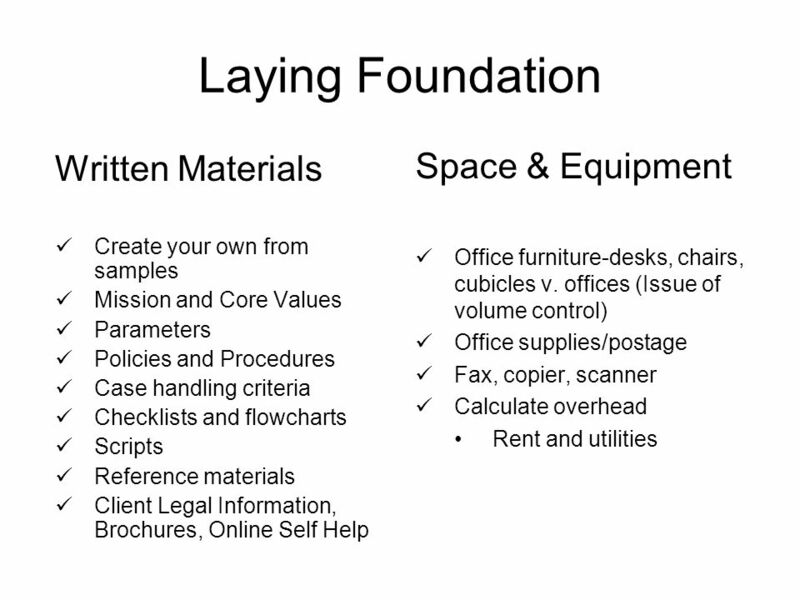 Build a Foundation There are many reasons to create a hotline. 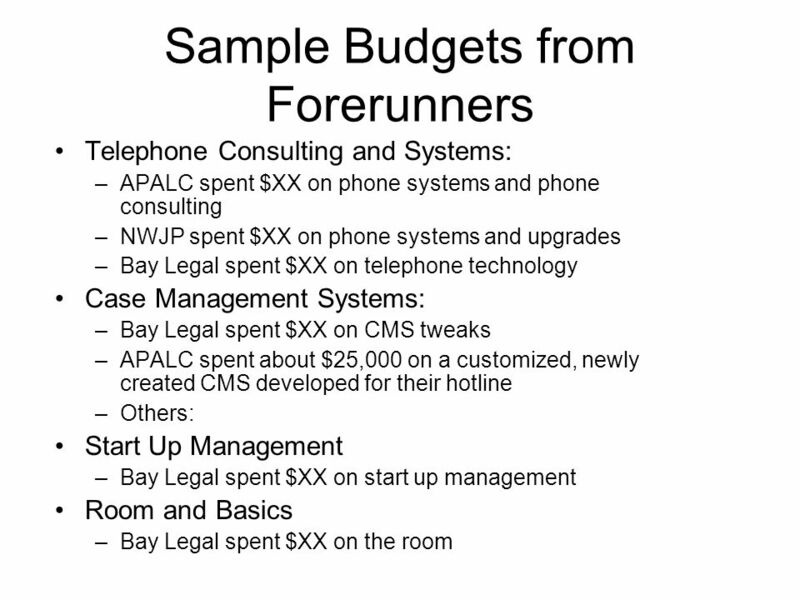 Some have to do with client access; some have to do with funding. 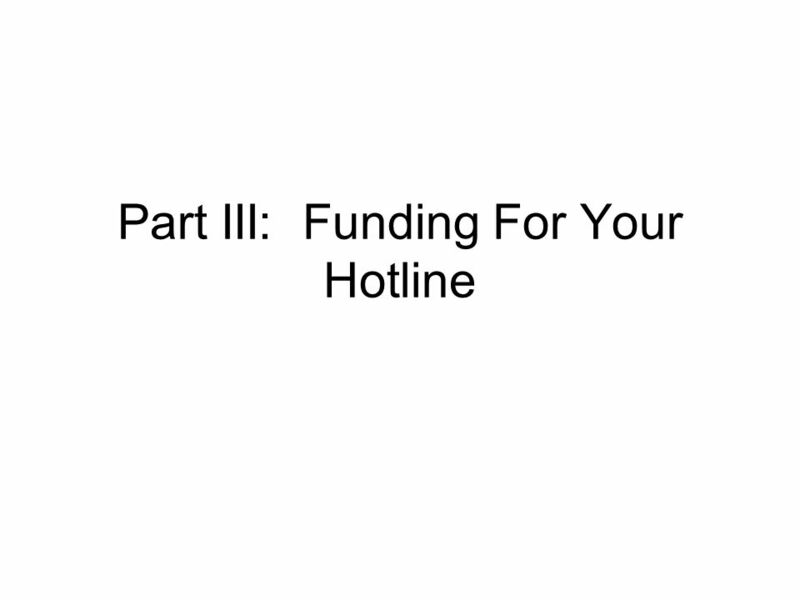 2 Build a Foundation There are many reasons to create a hotline. 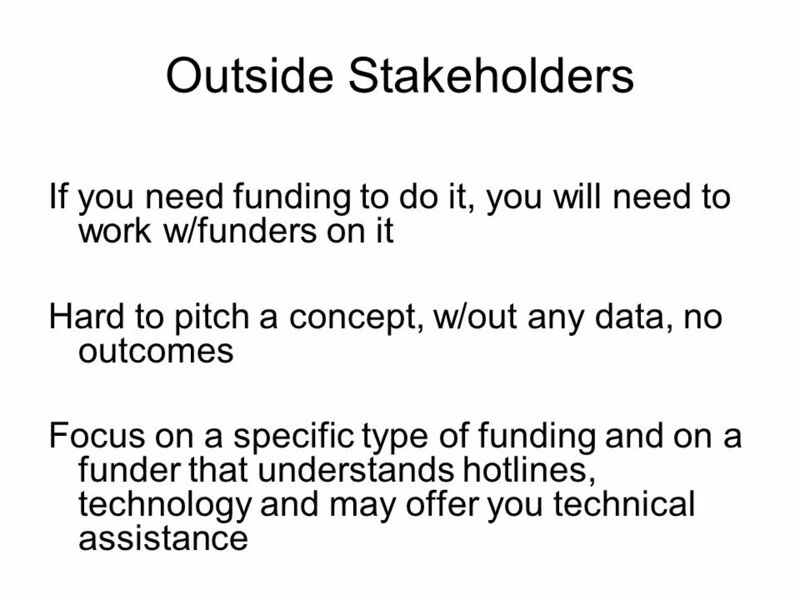 Some have to do with client access; some have to do with funding. 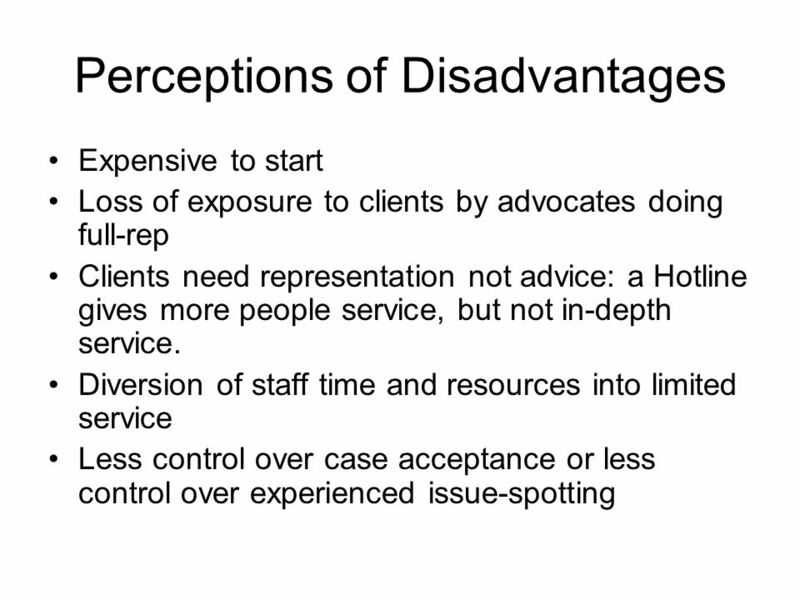 The number one reason hotlines fail is because the program and/or staff do not recognize the goal of having a hotline and its benefit for clients. 3 Vision The backbone of leadership is vision. 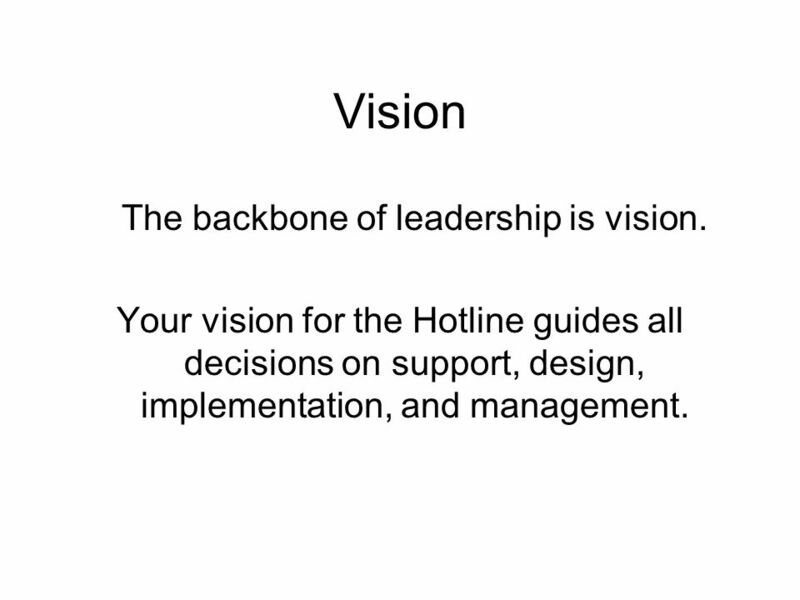 Your vision for the Hotline guides all decisions on support, design, implementation, and management. 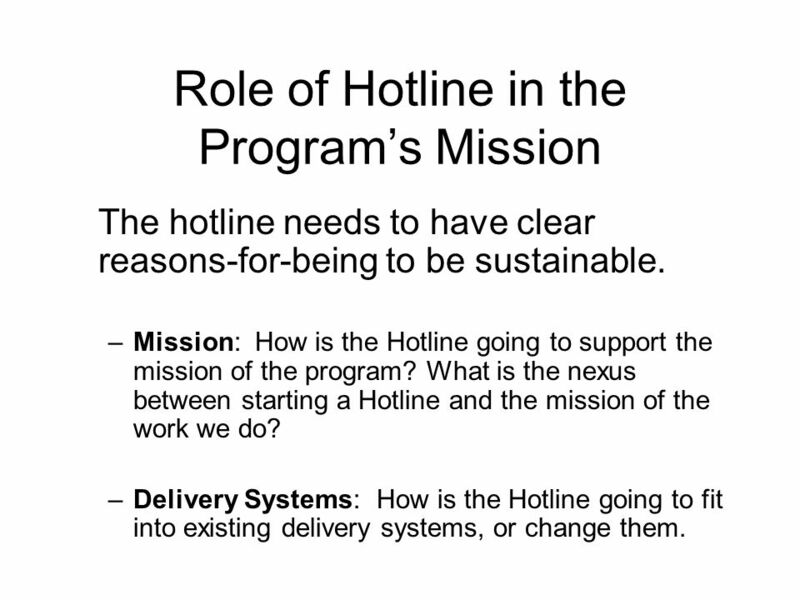 5 Role of Hotline in the Programs Mission The hotline needs to have clear reasons-for-being to be sustainable. 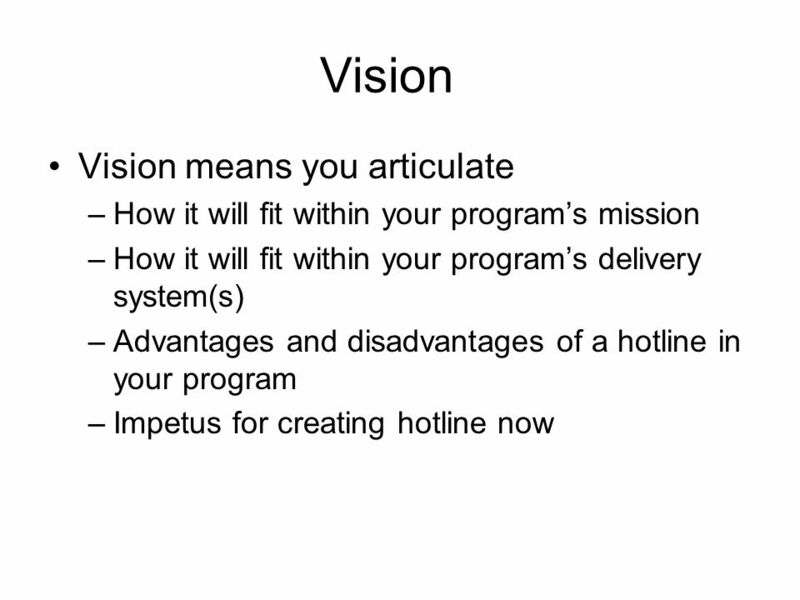 –Mission: How is the Hotline going to support the mission of the program? 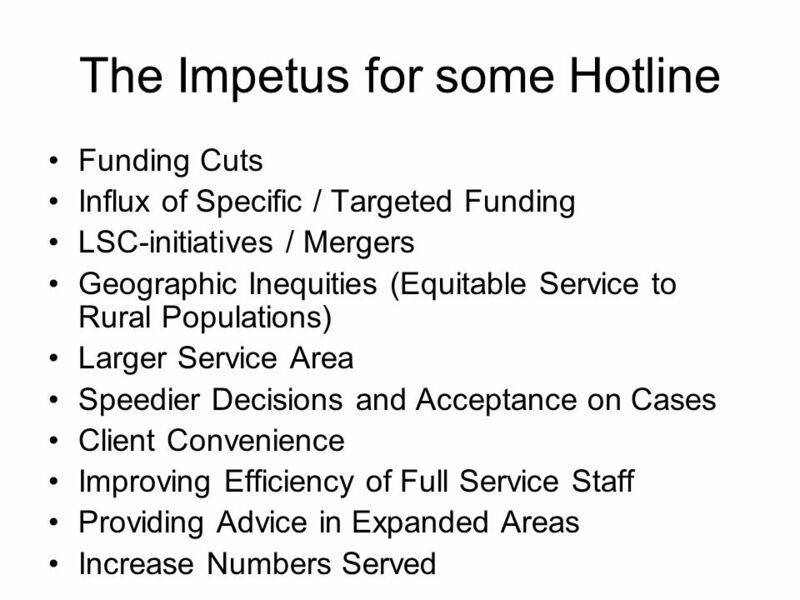 What is the nexus between starting a Hotline and the mission of the work we do? 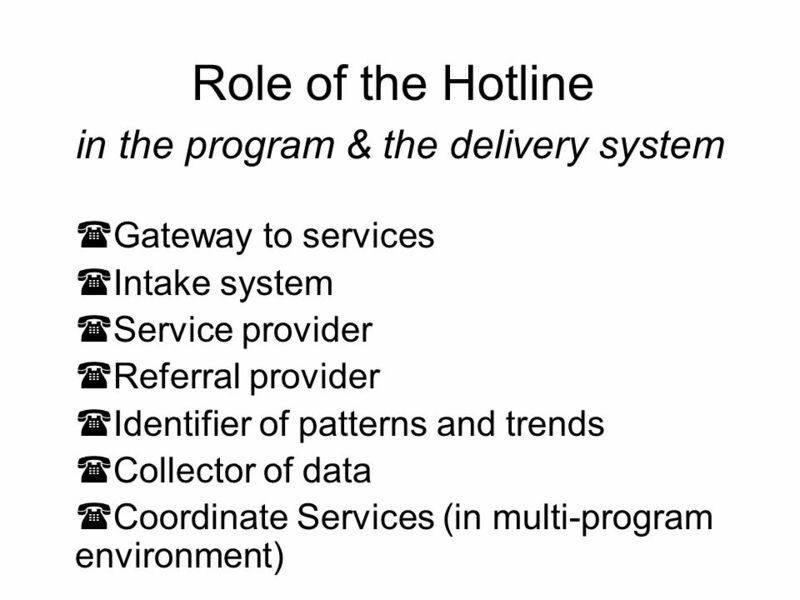 –Delivery Systems: How is the Hotline going to fit into existing delivery systems, or change them. 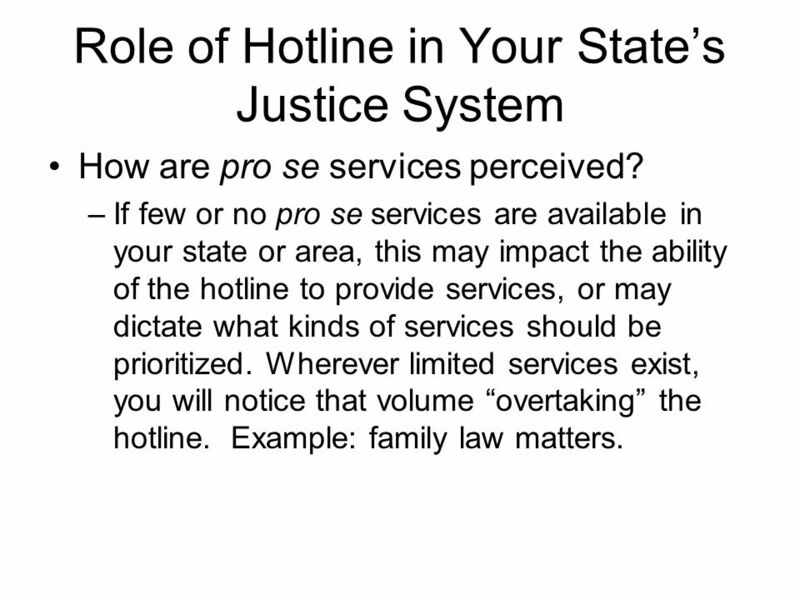 7 Role of Hotline in Your States Justice System How are pro se services perceived? 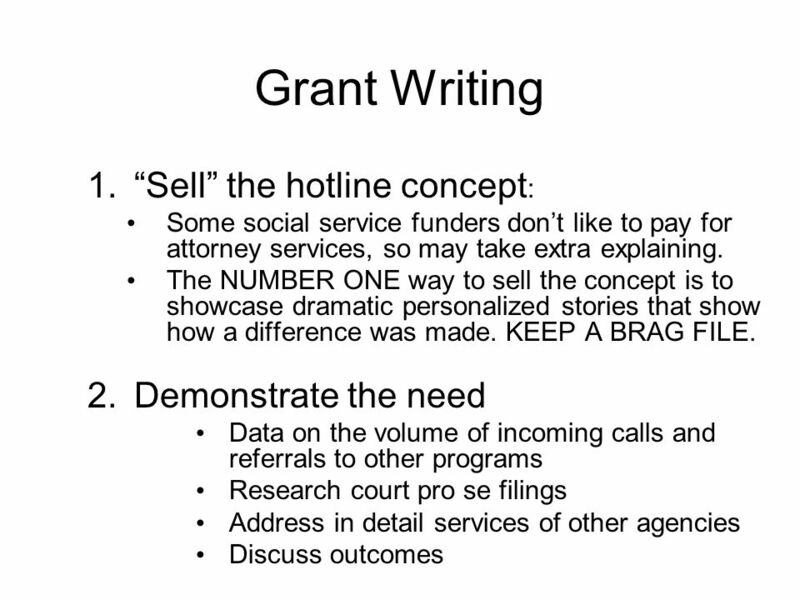 –If few or no pro se services are available in your state or area, this may impact the ability of the hotline to provide services, or may dictate what kinds of services should be prioritized. 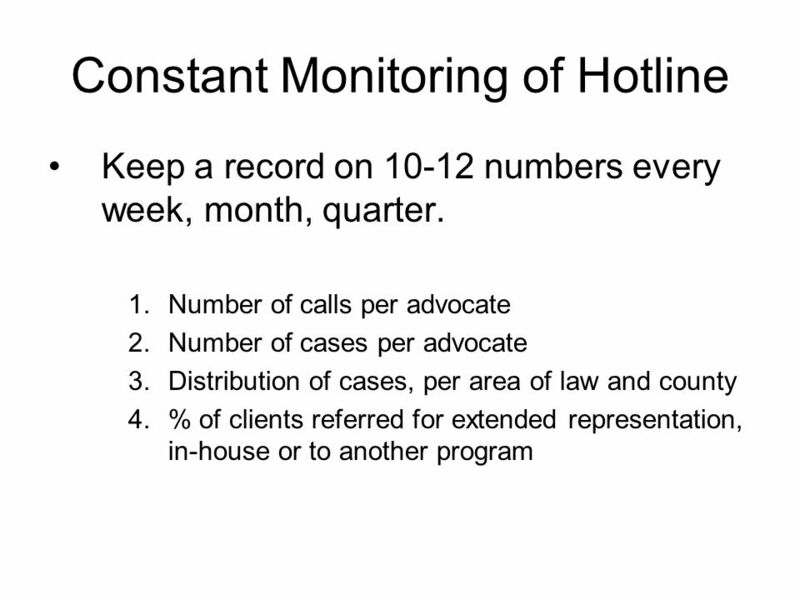 Wherever limited services exist, you will notice that volume overtaking the hotline. Example: family law matters. 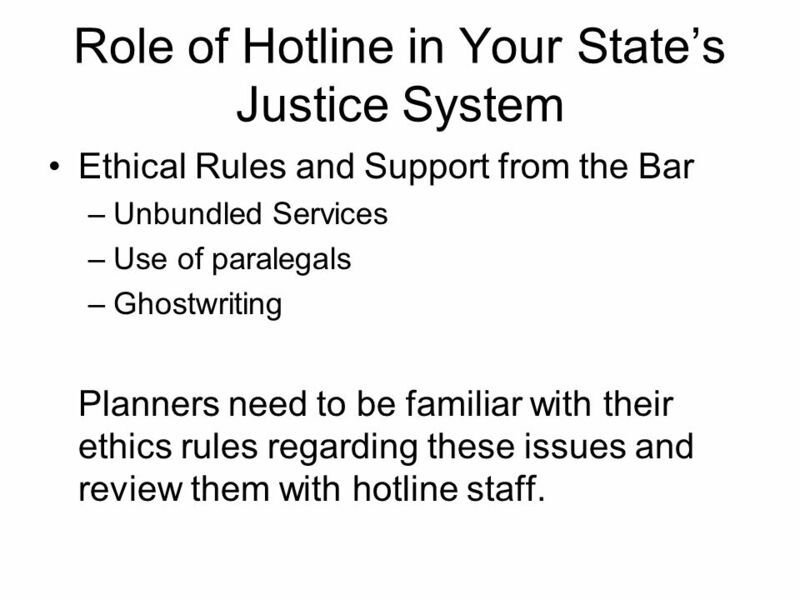 8 Role of Hotline in Your States Justice System Ethical Rules and Support from the Bar –Unbundled Services –Use of paralegals –Ghostwriting Planners need to be familiar with their ethics rules regarding these issues and review them with hotline staff. 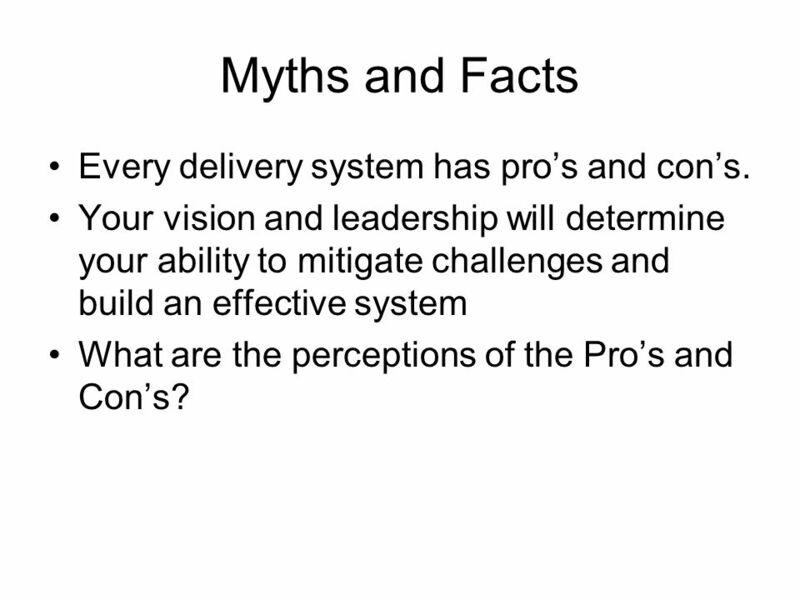 9 Myths and Facts Every delivery system has pros and cons. 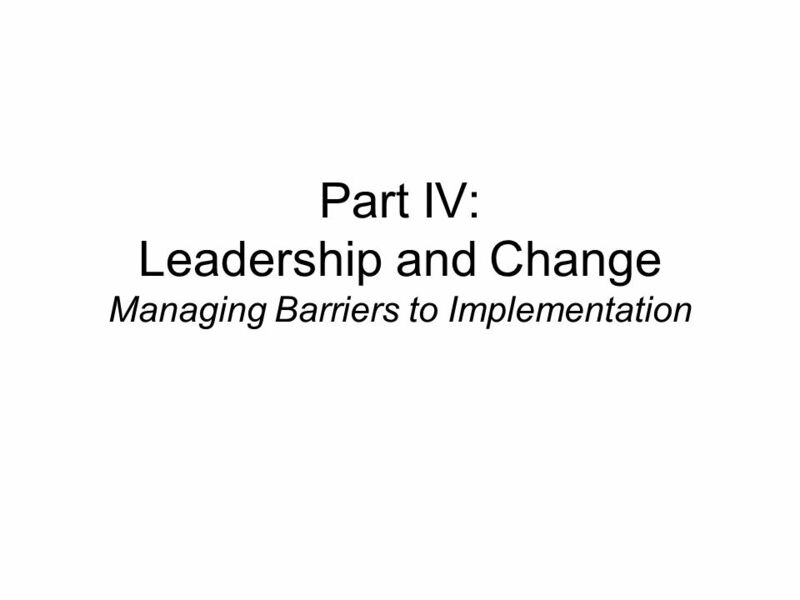 Your vision and leadership will determine your ability to mitigate challenges and build an effective system What are the perceptions of the Pros and Cons? 12 Pros Versus Cons? 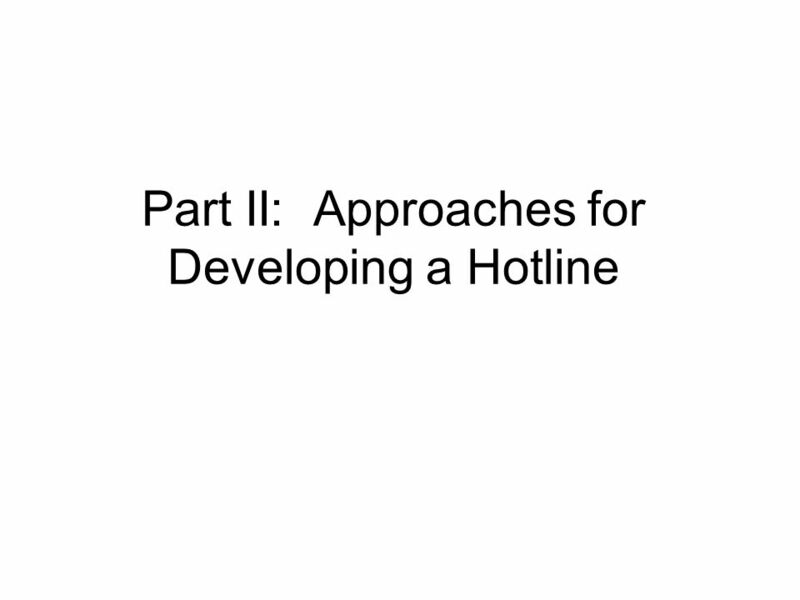 An exact polarity of the pros and cons of a hotline, in fact, does not exist. 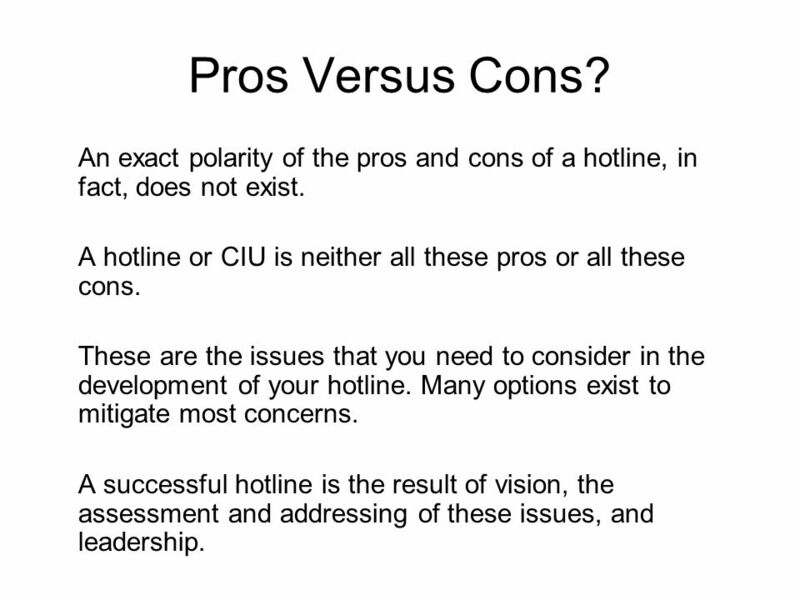 A hotline or CIU is neither all these pros or all these cons. 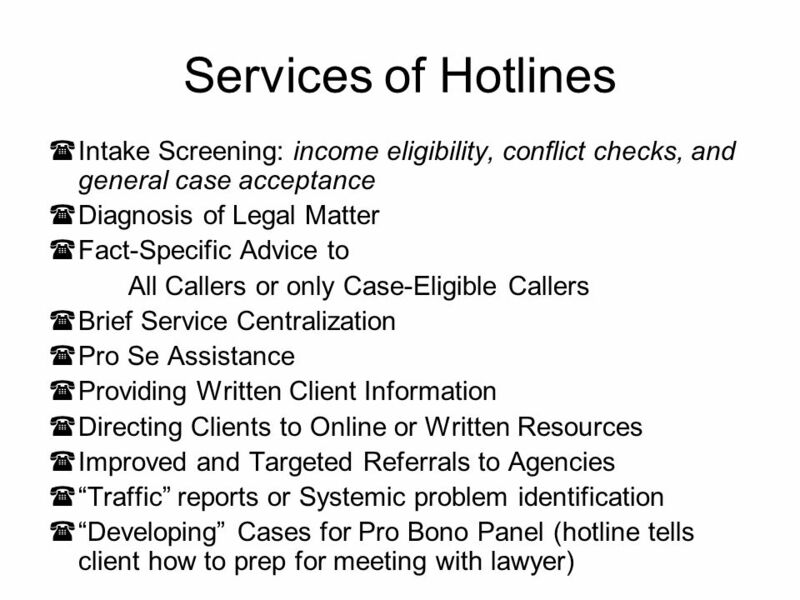 These are the issues that you need to consider in the development of your hotline. 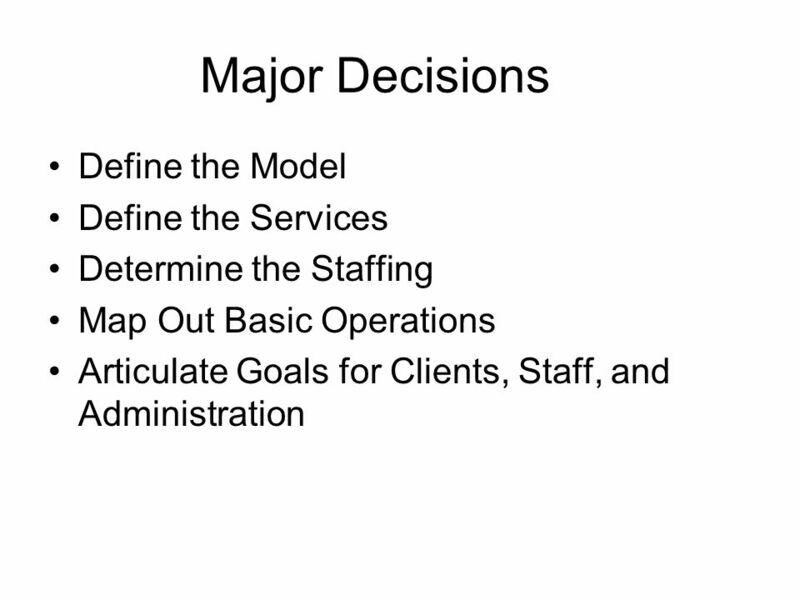 Many options exist to mitigate most concerns. 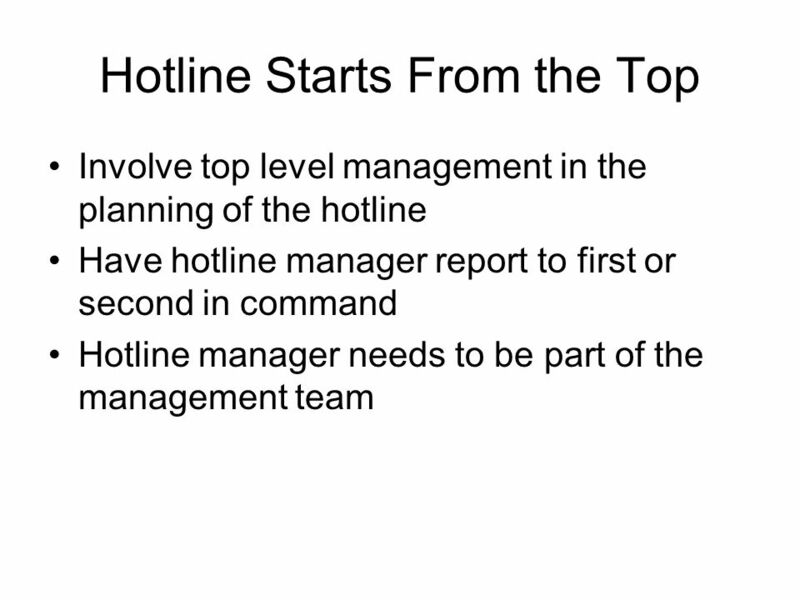 A successful hotline is the result of vision, the assessment and addressing of these issues, and leadership. 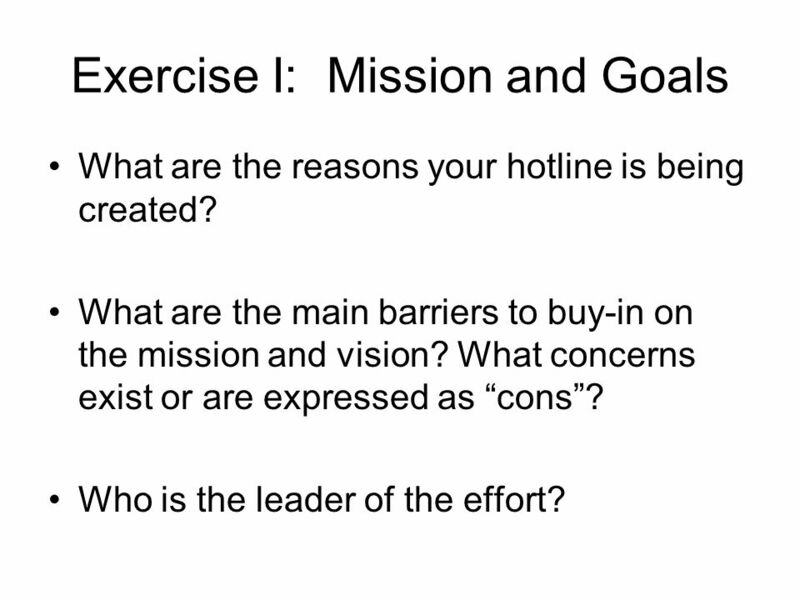 14 Exercise I: Mission and Goals What are the reasons your hotline is being created? What are the main barriers to buy-in on the mission and vision? What concerns exist or are expressed as cons? Who is the leader of the effort? 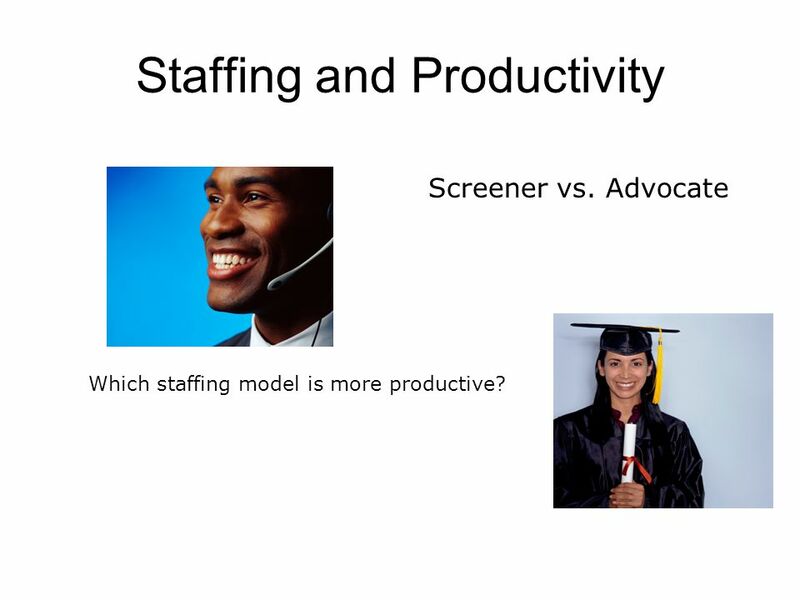 28 Staffing and Productivity Screener vs. Advocate Which staffing model is more productive? 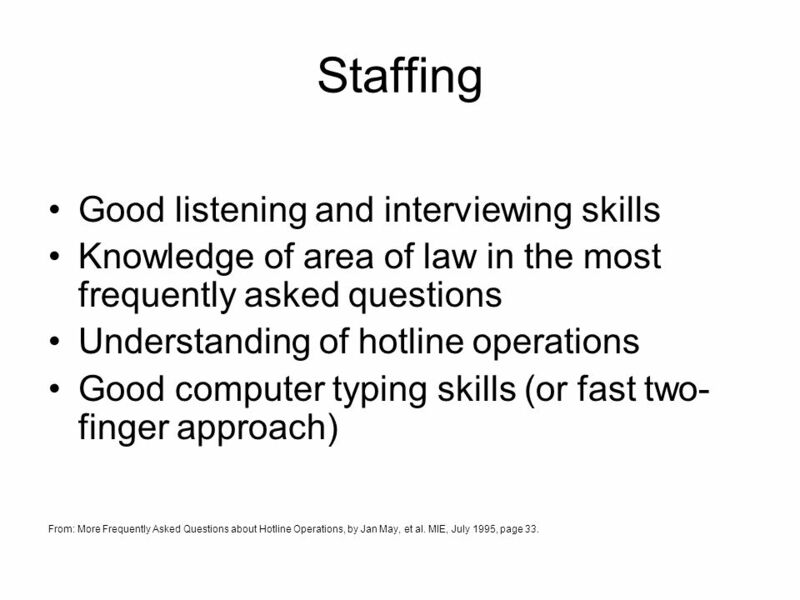 30 Staffing Good listening and interviewing skills Knowledge of area of law in the most frequently asked questions Understanding of hotline operations Good computer typing skills (or fast two- finger approach) From: More Frequently Asked Questions about Hotline Operations, by Jan May, et al. MIE, July 1995, page 33. 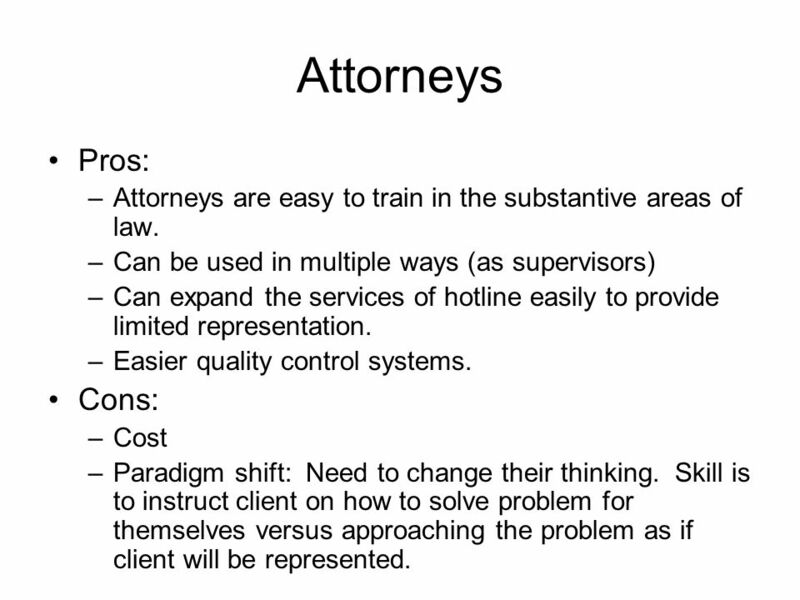 32 Attorneys Pros: –Attorneys are easy to train in the substantive areas of law. 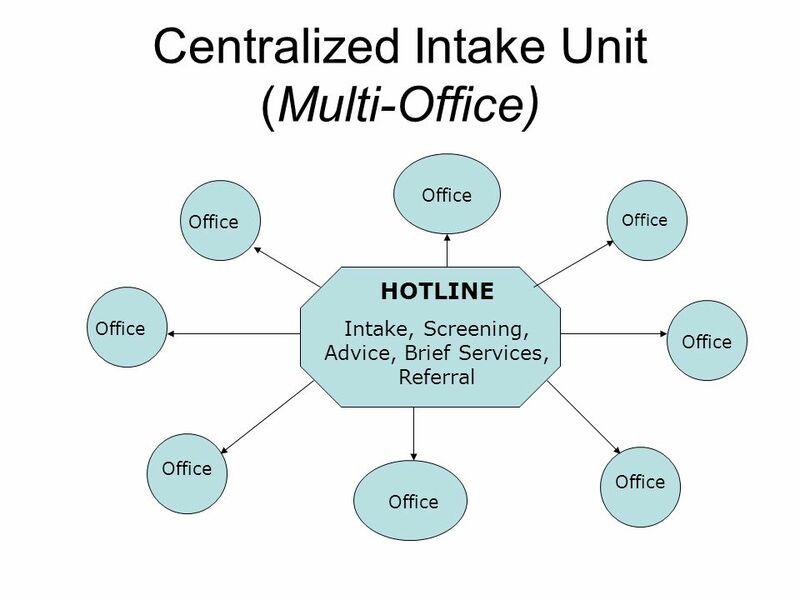 –Can be used in multiple ways (as supervisors) –Can expand the services of hotline easily to provide limited representation. –Easier quality control systems. Cons: –Cost –Paradigm shift: Need to change their thinking. Skill is to instruct client on how to solve problem for themselves versus approaching the problem as if client will be represented. 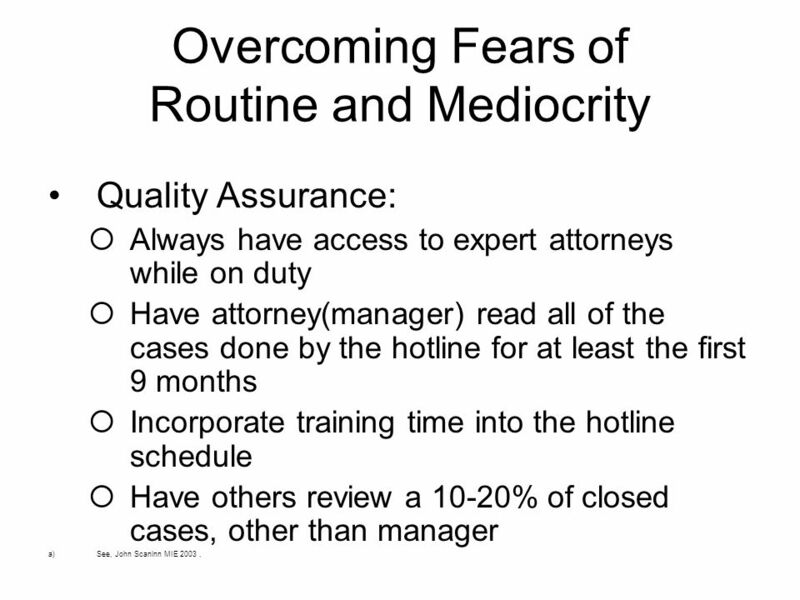 33 Non-Attorneys –Non-attorneys are conscientious about learning the areas of law, but training time is longer and extensions supervision is needed. Depth of knowledge is weak. Quality control methods are essential. 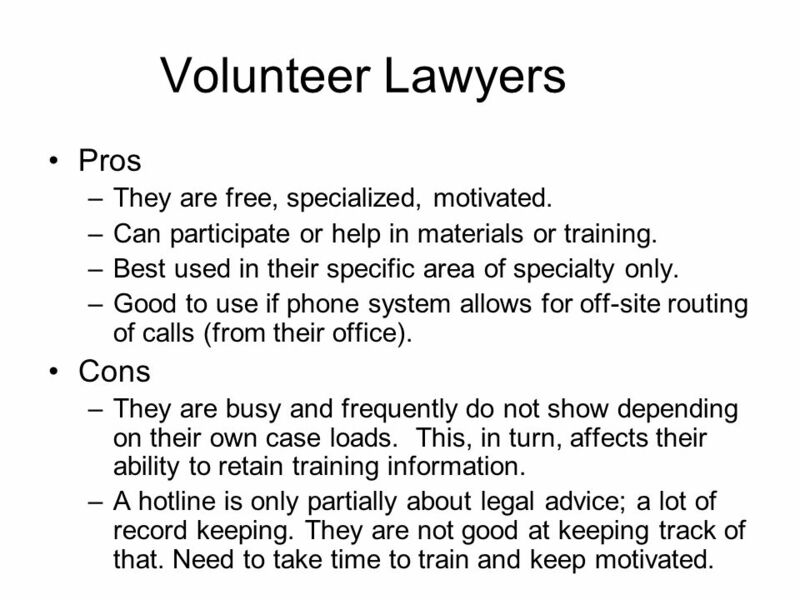 34 Volunteer Lawyers Pros –They are free, specialized, motivated. –Can participate or help in materials or training. –Best used in their specific area of specialty only. 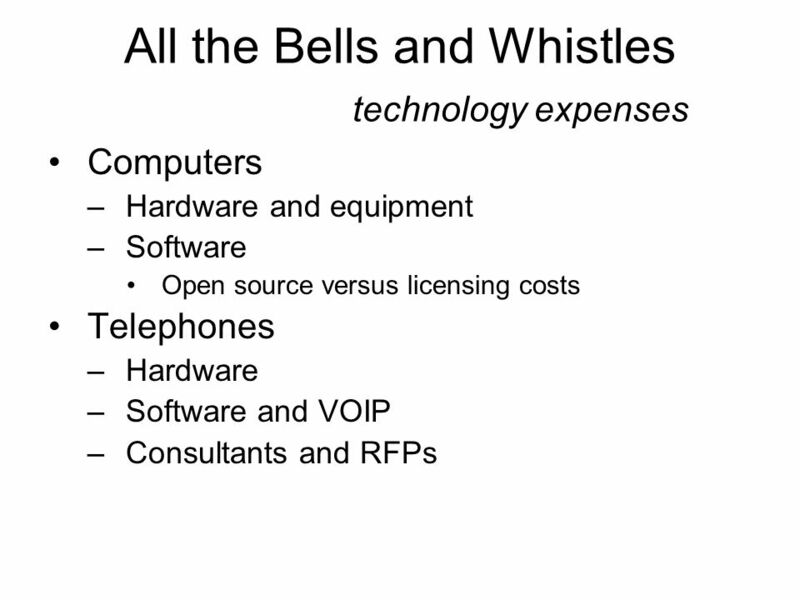 –Good to use if phone system allows for off-site routing of calls (from their office). Cons –They are busy and frequently do not show depending on their own case loads. This, in turn, affects their ability to retain training information. 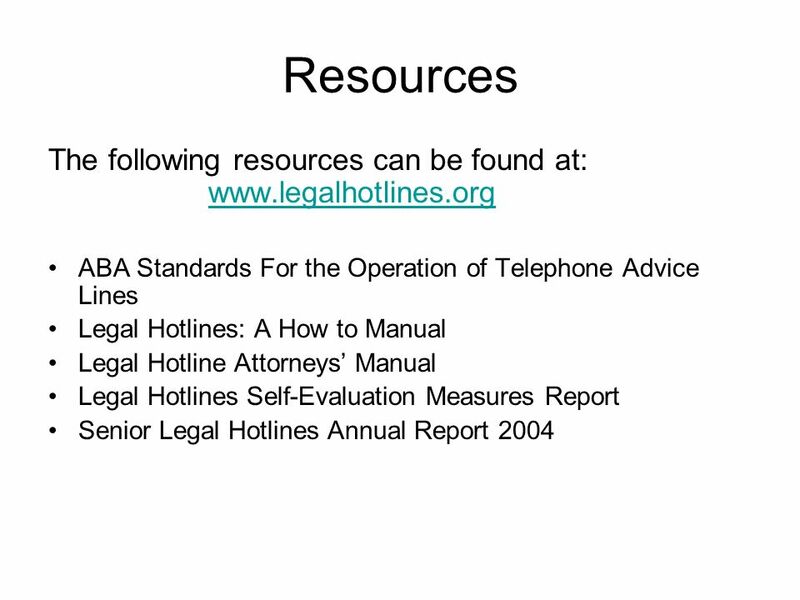 –A hotline is only partially about legal advice; a lot of record keeping. They are not good at keeping track of that. Need to take time to train and keep motivated. 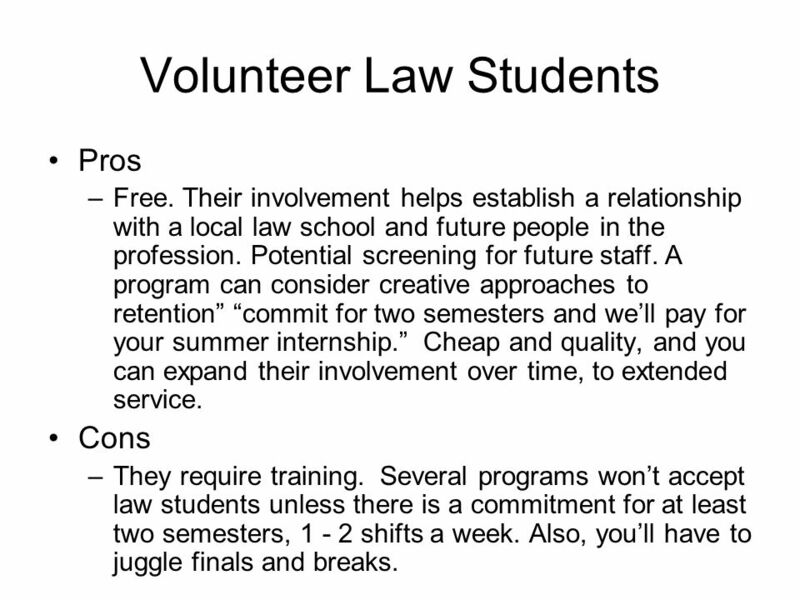 35 Volunteer Law Students Pros –Free. Their involvement helps establish a relationship with a local law school and future people in the profession. Potential screening for future staff. 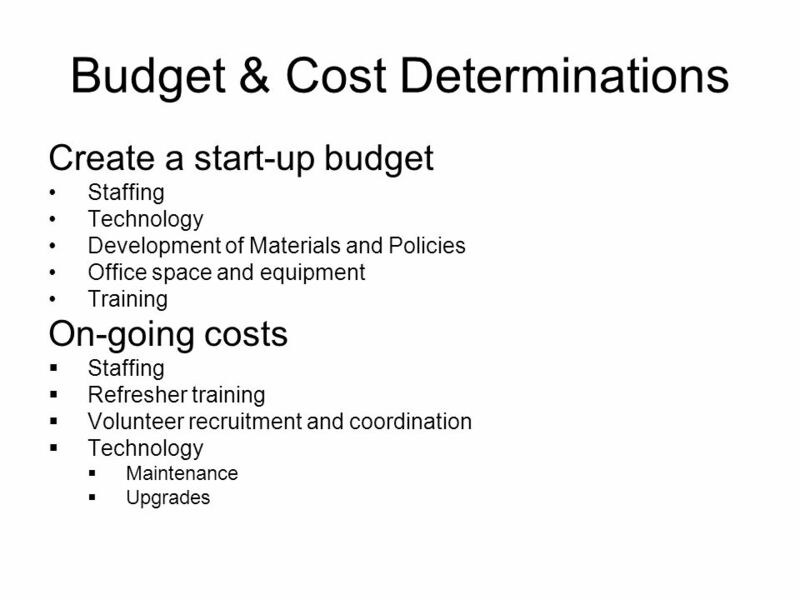 A program can consider creative approaches to retention commit for two semesters and well pay for your summer internship. Cheap and quality, and you can expand their involvement over time, to extended service. 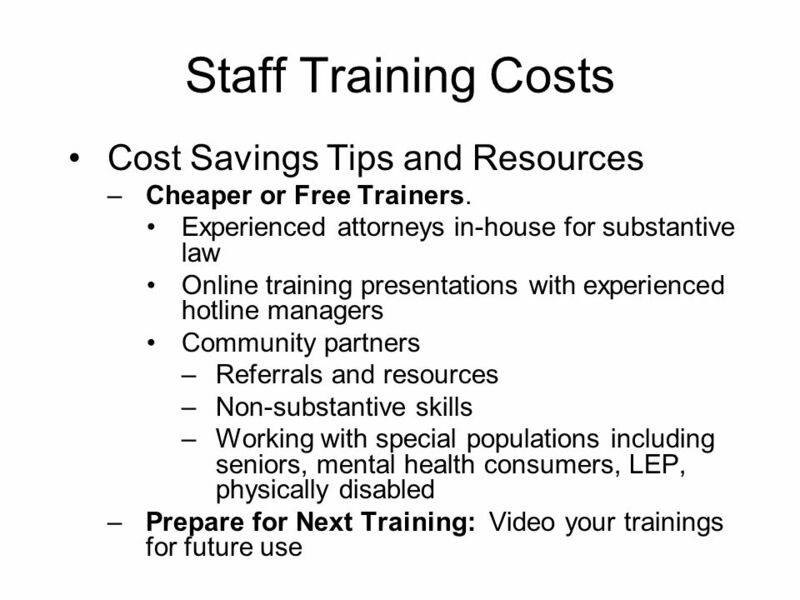 Cons –They require training. 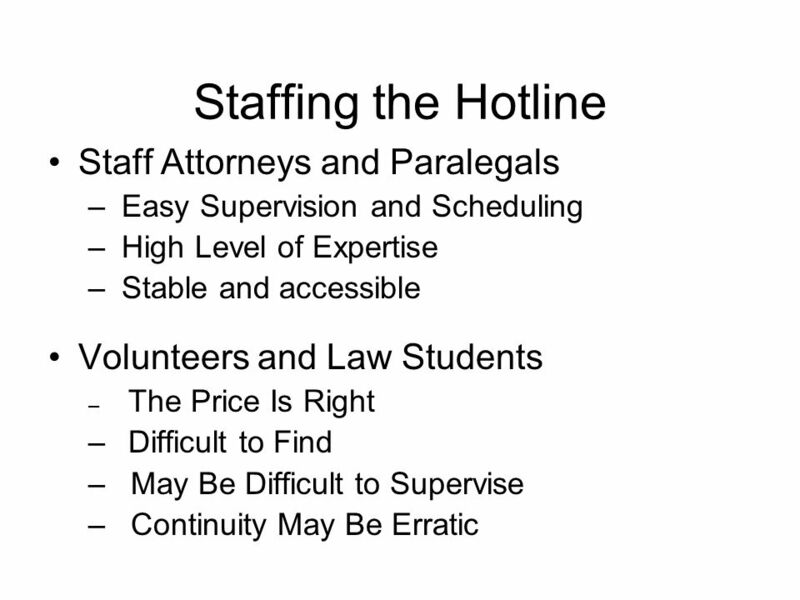 Several programs wont accept law students unless there is a commitment for at least two semesters, 1 - 2 shifts a week. Also, youll have to juggle finals and breaks. 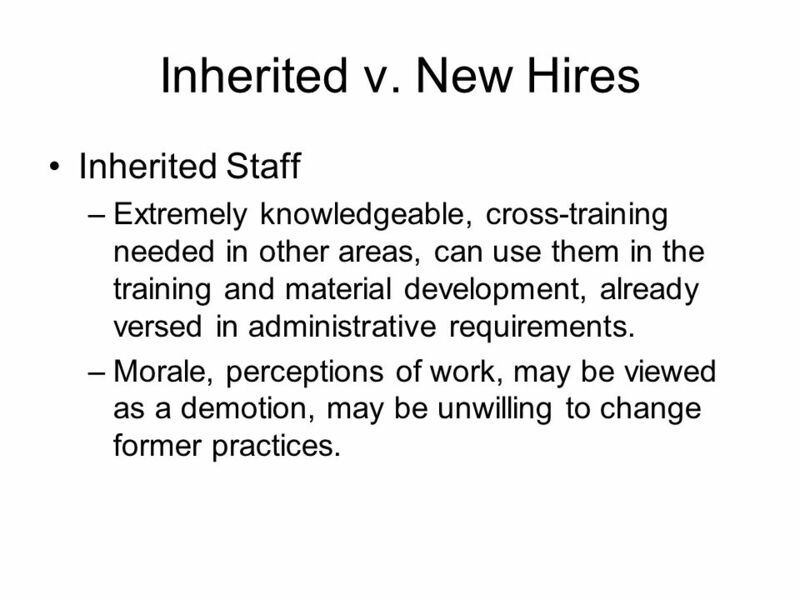 36 Inherited v. New Hires Inherited Staff –Extremely knowledgeable, cross-training needed in other areas, can use them in the training and material development, already versed in administrative requirements. –Morale, perceptions of work, may be viewed as a demotion, may be unwilling to change former practices. 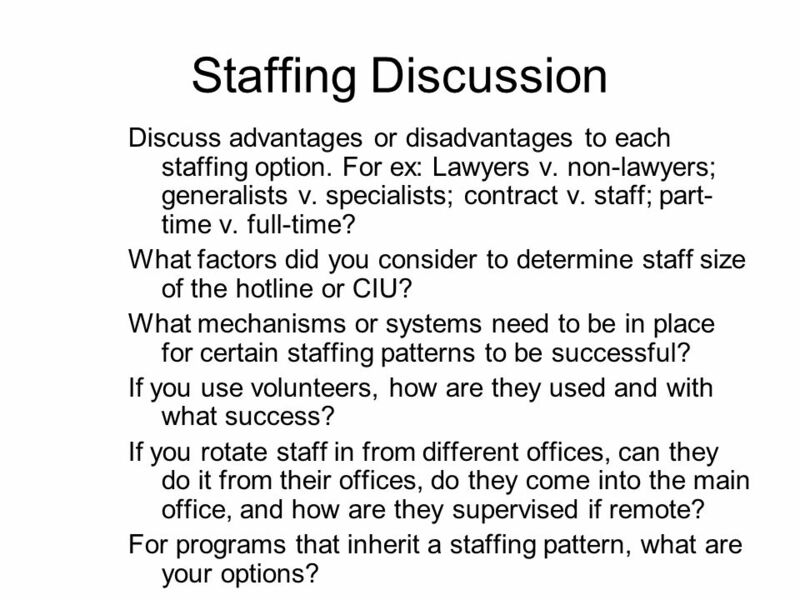 37 Staffing Discussion Discuss advantages or disadvantages to each staffing option. 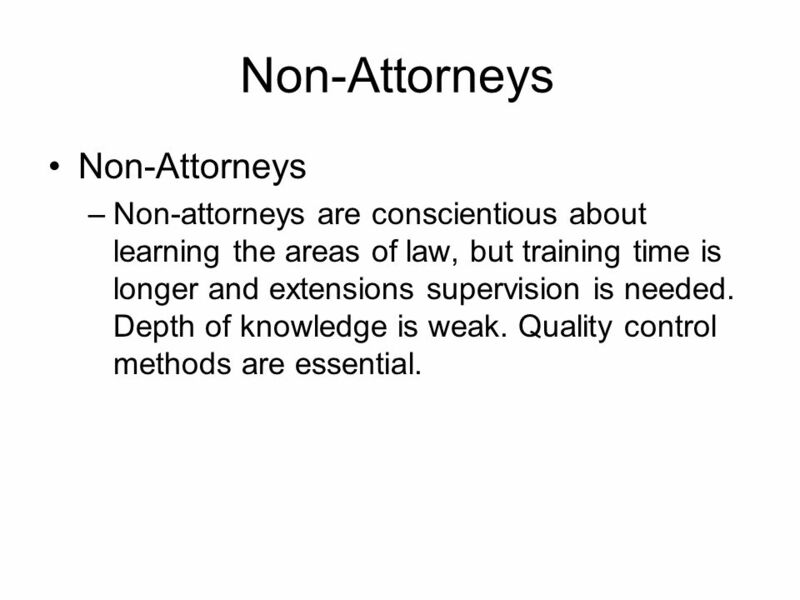 For ex: Lawyers v. non-lawyers; generalists v. specialists; contract v. staff; part- time v. full-time? 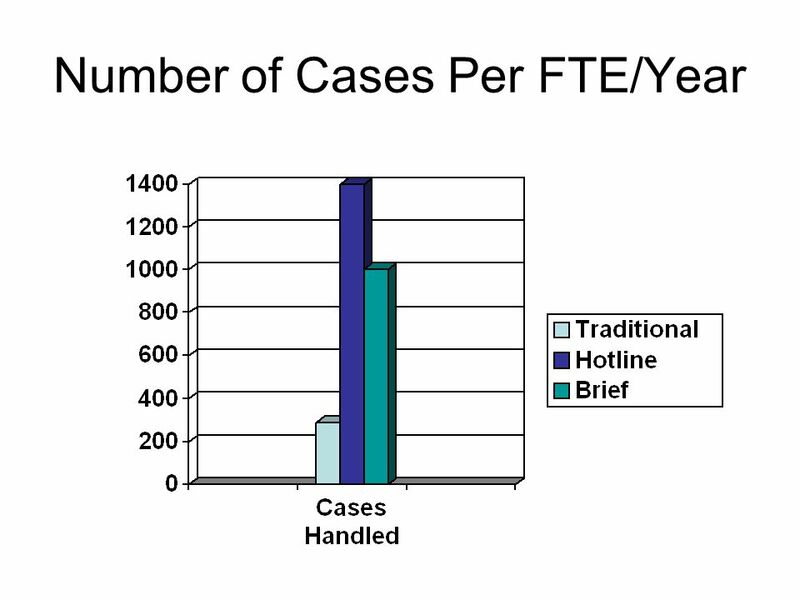 What factors did you consider to determine staff size of the hotline or CIU? 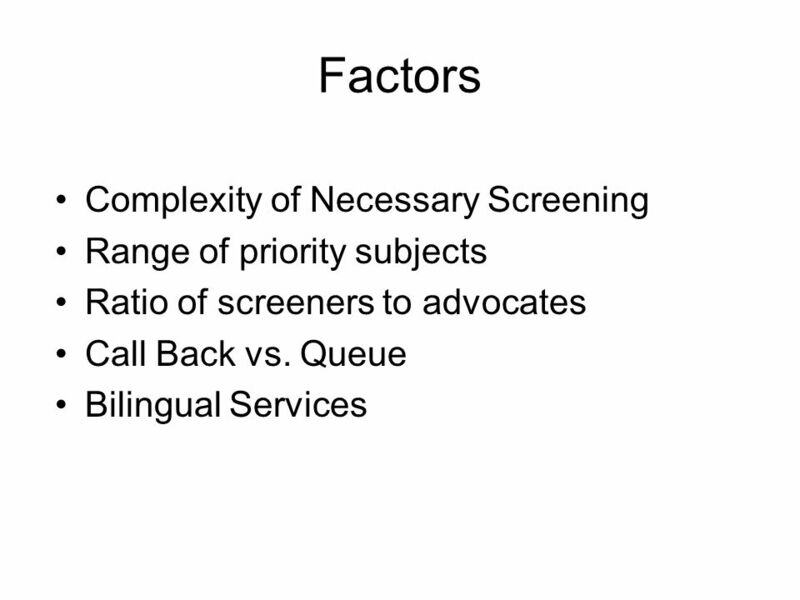 What mechanisms or systems need to be in place for certain staffing patterns to be successful? If you use volunteers, how are they used and with what success? If you rotate staff in from different offices, can they do it from their offices, do they come into the main office, and how are they supervised if remote? 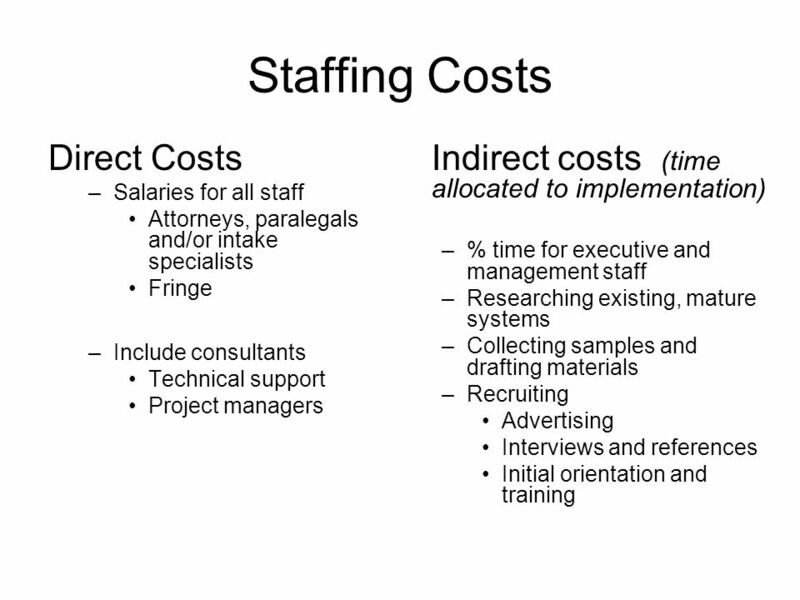 For programs that inherit a staffing pattern, what are your options? 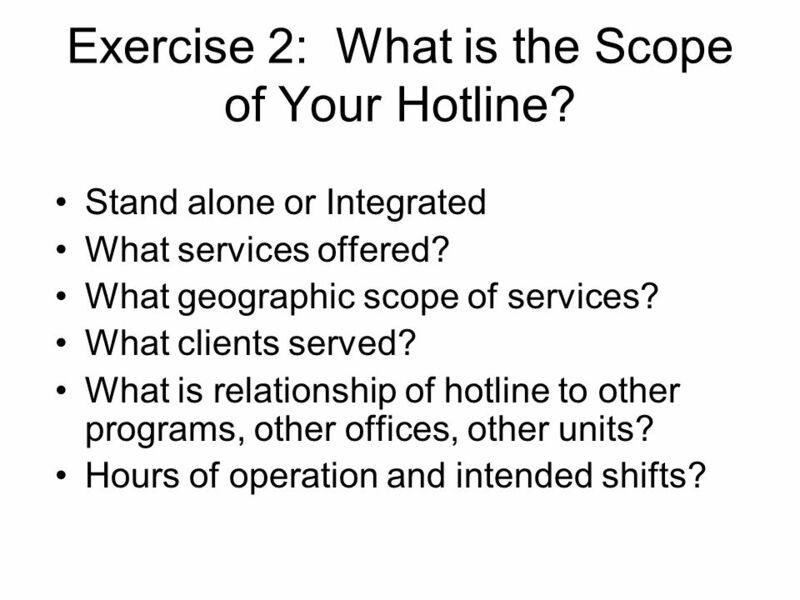 38 Exercise 2: What is the Scope of Your Hotline? Stand alone or Integrated What services offered? 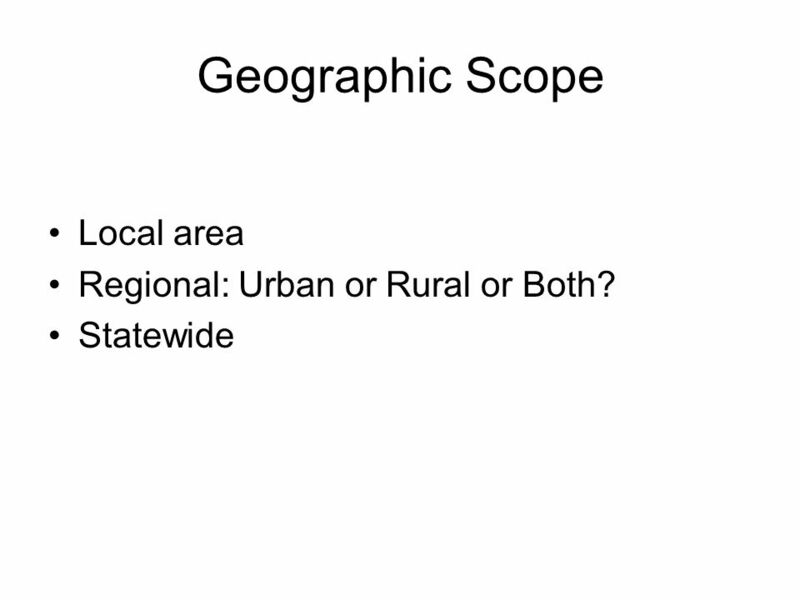 What geographic scope of services? 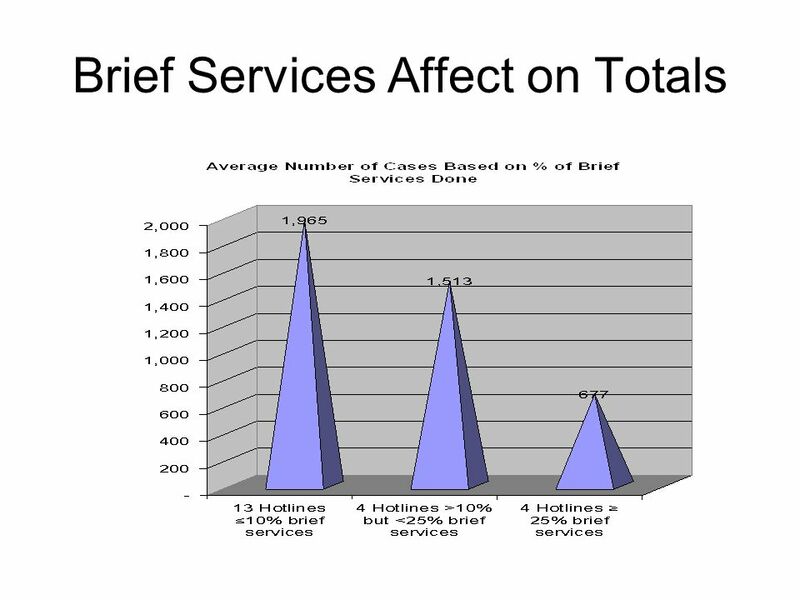 What clients served? 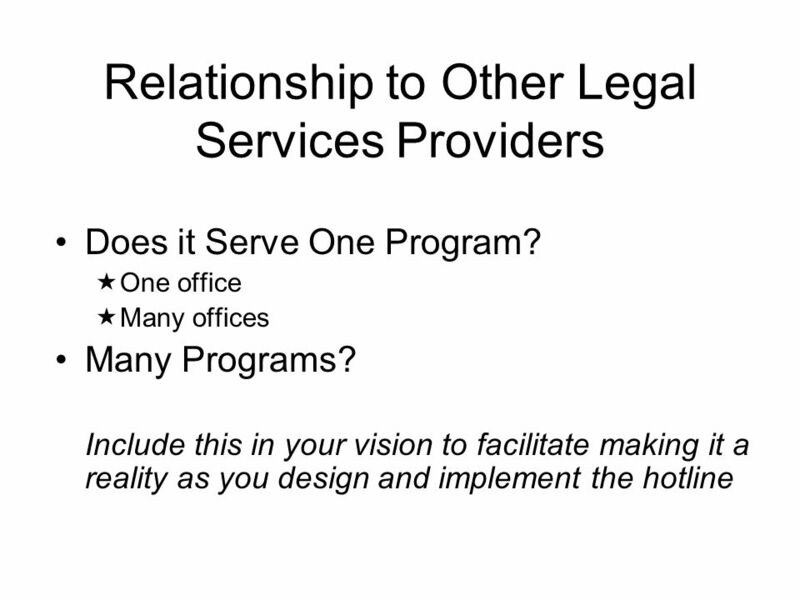 What is relationship of hotline to other programs, other offices, other units? 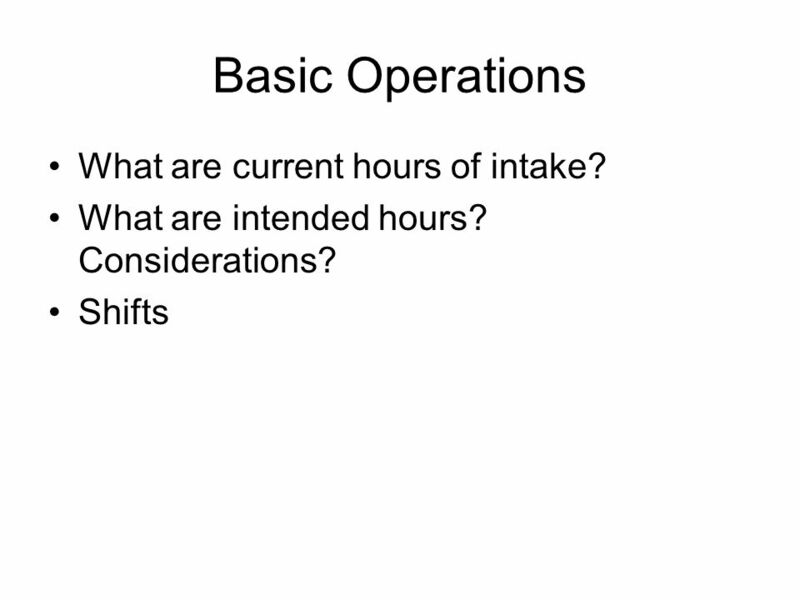 Hours of operation and intended shifts? 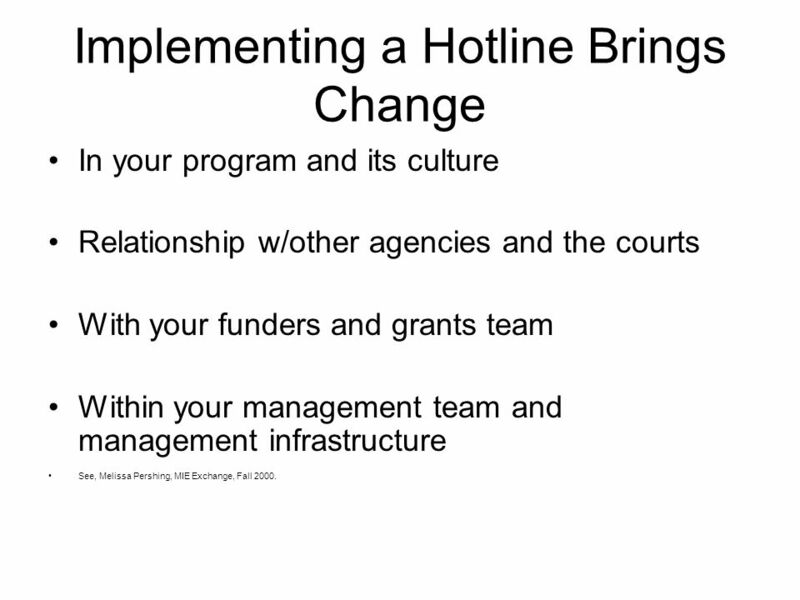 53 Implementing a Hotline Brings Change In your program and its culture Relationship w/other agencies and the courts With your funders and grants team Within your management team and management infrastructure See, Melissa Pershing, MIE Exchange, Fall 2000. 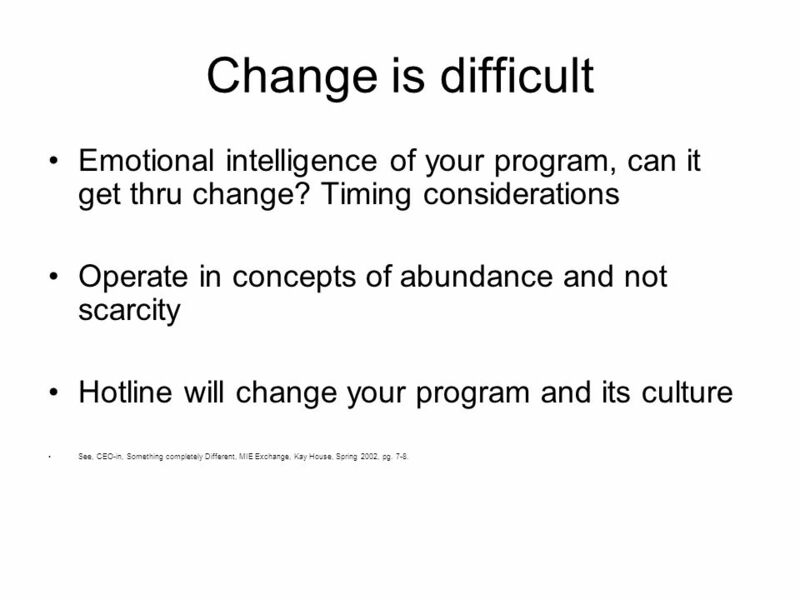 54 Change is difficult Emotional intelligence of your program, can it get thru change? 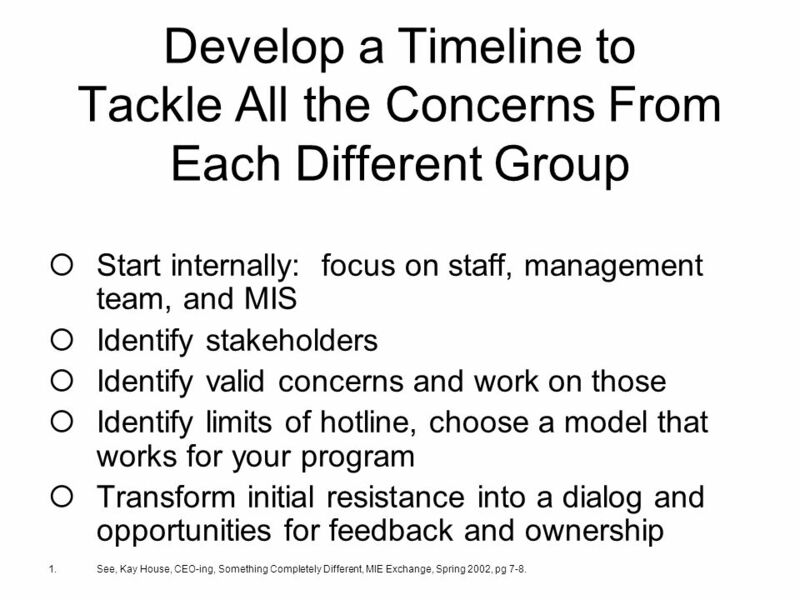 Timing considerations Operate in concepts of abundance and not scarcity Hotline will change your program and its culture See, CEO-in, Something completely Different, MIE Exchange, Kay House, Spring 2002, pg. 7-8. 56 Develop a Timeline to Tackle All the Concerns From Each Different Group Start internally: focus on staff, management team, and MIS Identify stakeholders Identify valid concerns and work on those Identify limits of hotline, choose a model that works for your program Transform initial resistance into a dialog and opportunities for feedback and ownership 1.See, Kay House, CEO-ing, Something Completely Different, MIE Exchange, Spring 2002, pg 7-8. 57 Fears of Staff Incorporate autonomy w/in daily schedules Include training time and down time into schedule Assign areas of ownership and special projects to each person Allow staff to as a team develop their own shift schedules, break time, etc. and be responsible for coverage Create a team that is a problem solving, self- reliant, and that can work together to overcome most obstacles. See John Tull, MIE Exchange, Spring 2003 and Victor Geminiani, The implementation of a hotline, MIE Exchange, July 1995. 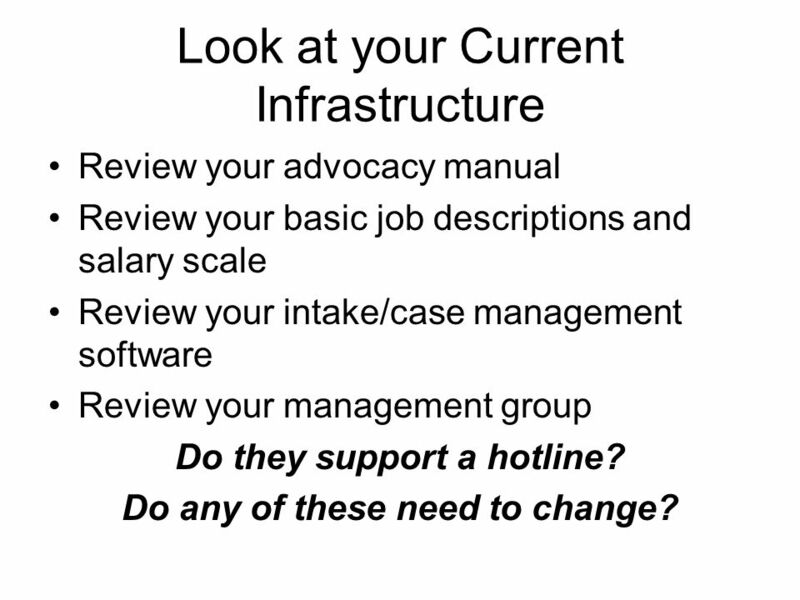 60 Look at your Current Infrastructure Review your advocacy manual Review your basic job descriptions and salary scale Review your intake/case management software Review your management group Do they support a hotline? Do any of these need to change? 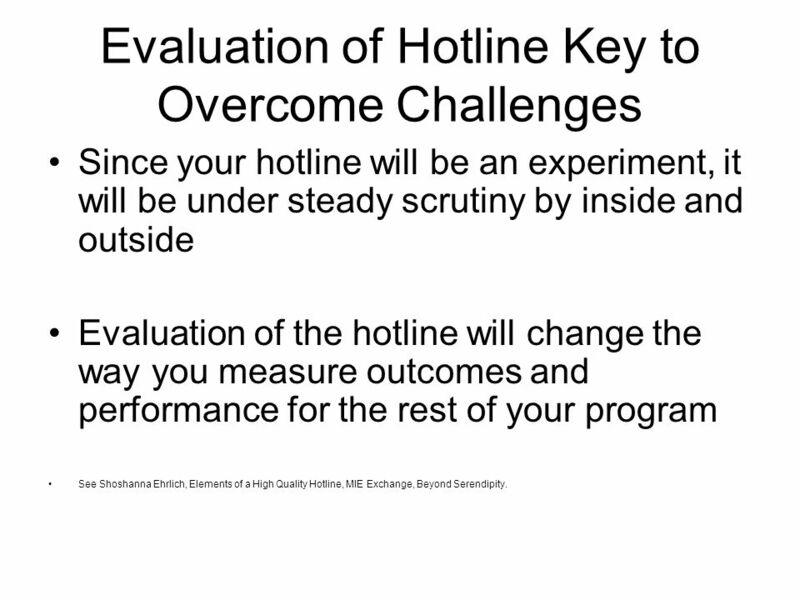 61 Evaluation of Hotline Key to Overcome Challenges Since your hotline will be an experiment, it will be under steady scrutiny by inside and outside Evaluation of the hotline will change the way you measure outcomes and performance for the rest of your program See Shoshanna Ehrlich, Elements of a High Quality Hotline, MIE Exchange, Beyond Serendipity. 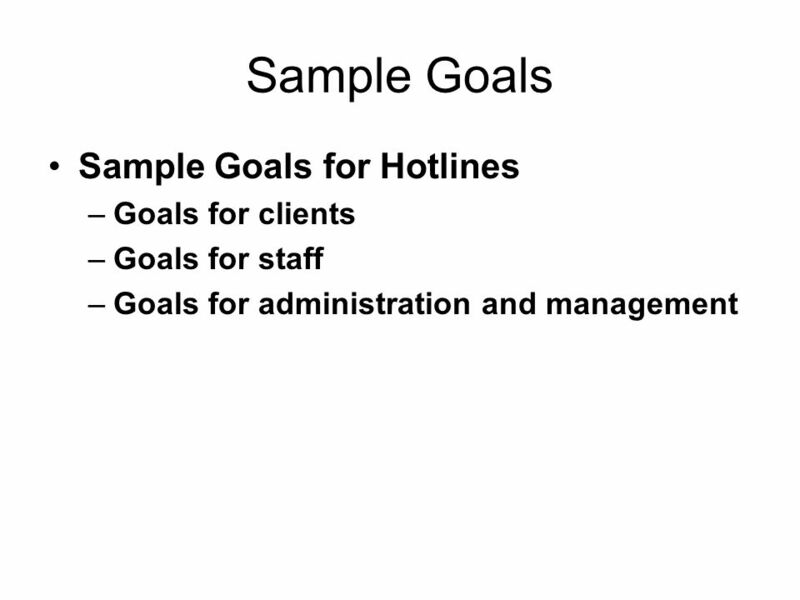 67 Goals for Staff No Geographical Barriers Among Staff: Our staff should be able to freely and frequently talk with each other for mentoring, case discussions, work planning, supervision and other types of support, whether or not they are based in the same physical office. 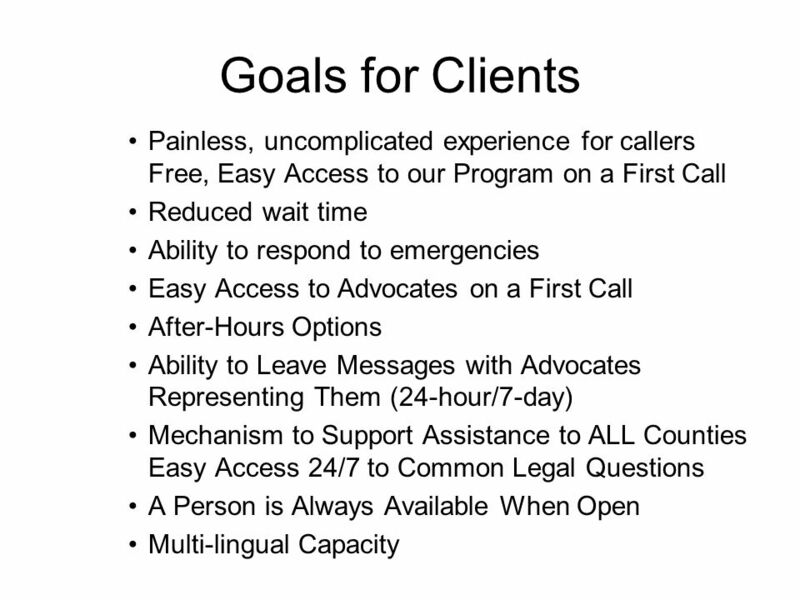 Maximized Use of Our Support staff: Support staff should be available for phone answering and document preparation for all offices and advocates, regardless of the physical office where they are based. Promote Productivity and Flexibility for Staff: Advocates should have flexibility to work from remote locations where appropriate to increase productivity and effectiveness. 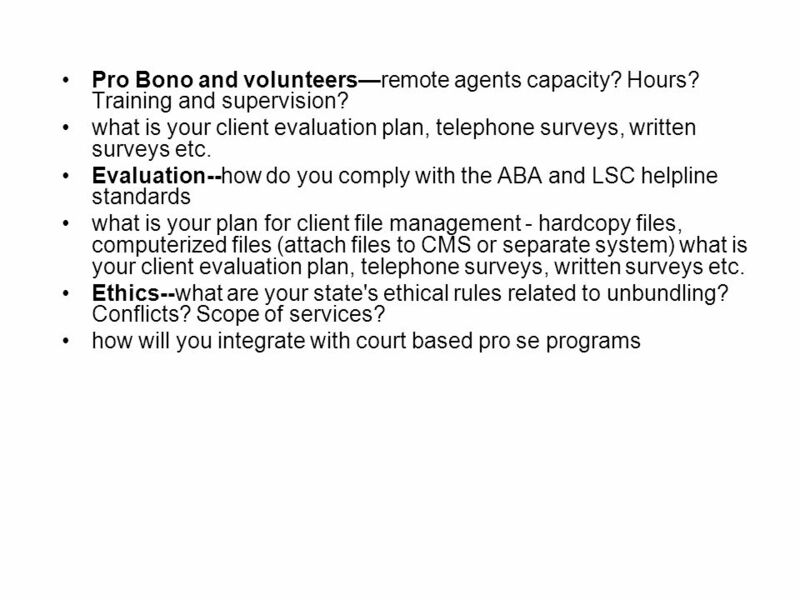 Facilitate Use of Pro Bono Attorneys and Part-Time Staff: Pro bono attorneys should have easy ability to communicate with clients and receive support from legal services staff, without having to physically come to the legal services office. 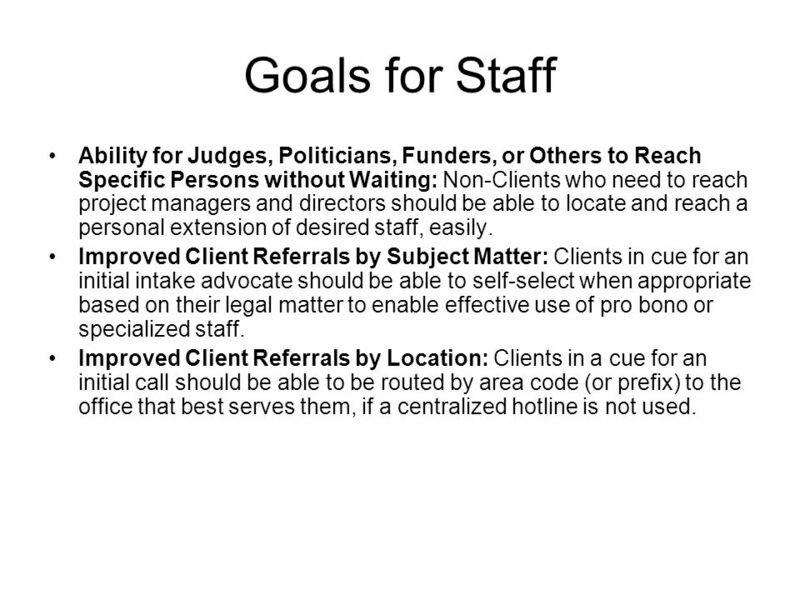 68 Goals for Staff Ability for Judges, Politicians, Funders, or Others to Reach Specific Persons without Waiting: Non-Clients who need to reach project managers and directors should be able to locate and reach a personal extension of desired staff, easily. 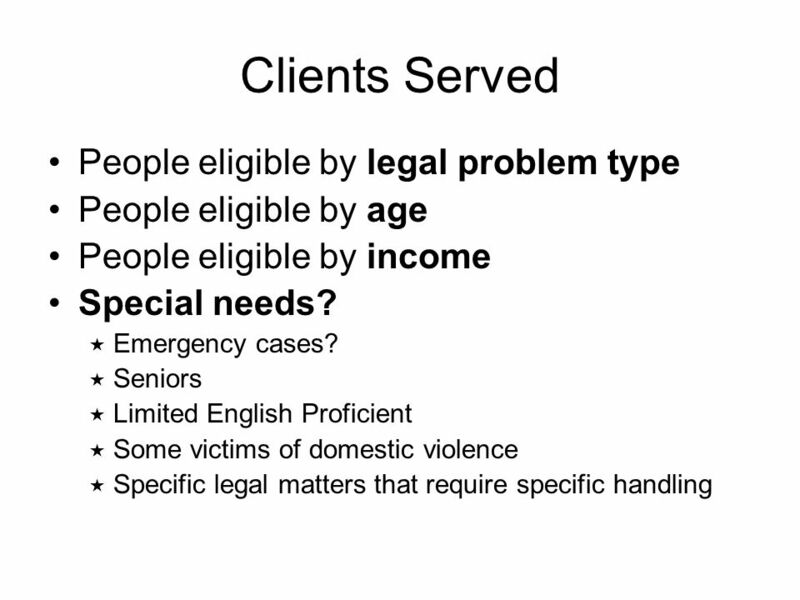 Improved Client Referrals by Subject Matter: Clients in cue for an initial intake advocate should be able to self-select when appropriate based on their legal matter to enable effective use of pro bono or specialized staff. 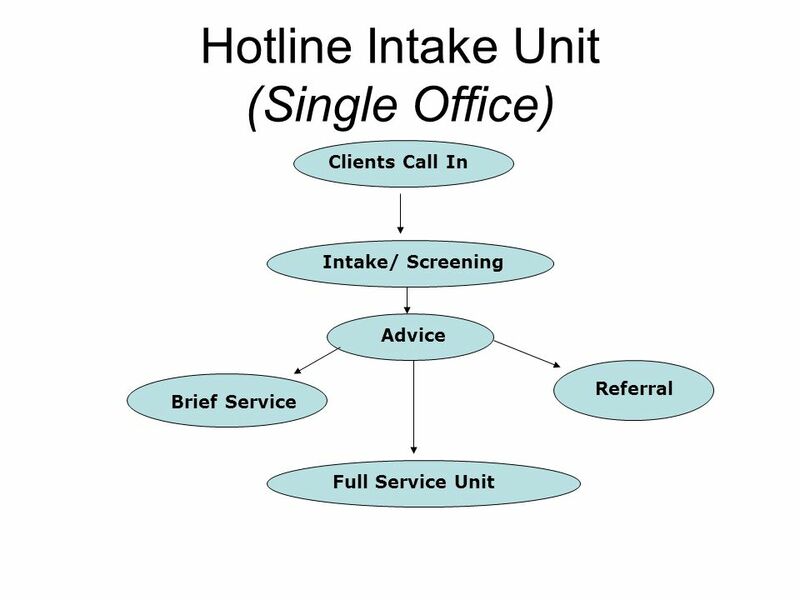 Improved Client Referrals by Location: Clients in a cue for an initial call should be able to be routed by area code (or prefix) to the office that best serves them, if a centralized hotline is not used. 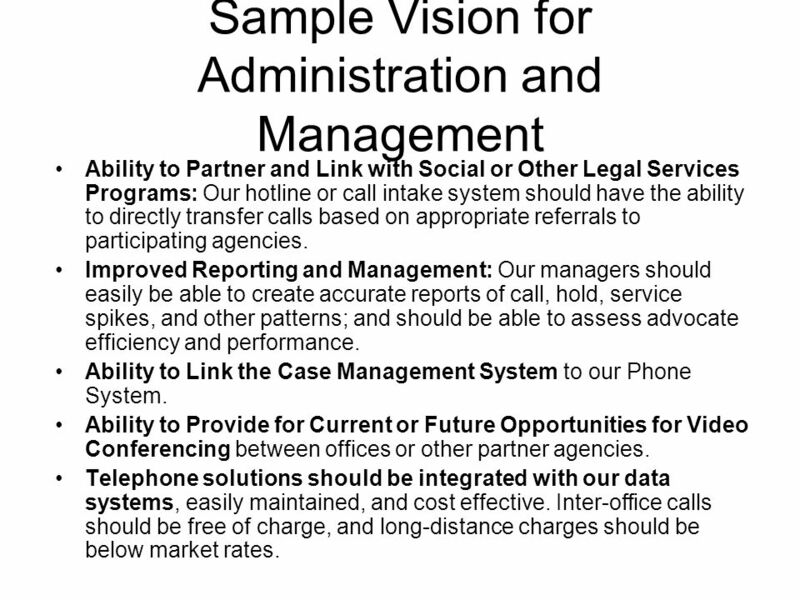 69 Sample Vision for Administration and Management Ability to Partner and Link with Social or Other Legal Services Programs: Our hotline or call intake system should have the ability to directly transfer calls based on appropriate referrals to participating agencies. Improved Reporting and Management: Our managers should easily be able to create accurate reports of call, hold, service spikes, and other patterns; and should be able to assess advocate efficiency and performance. 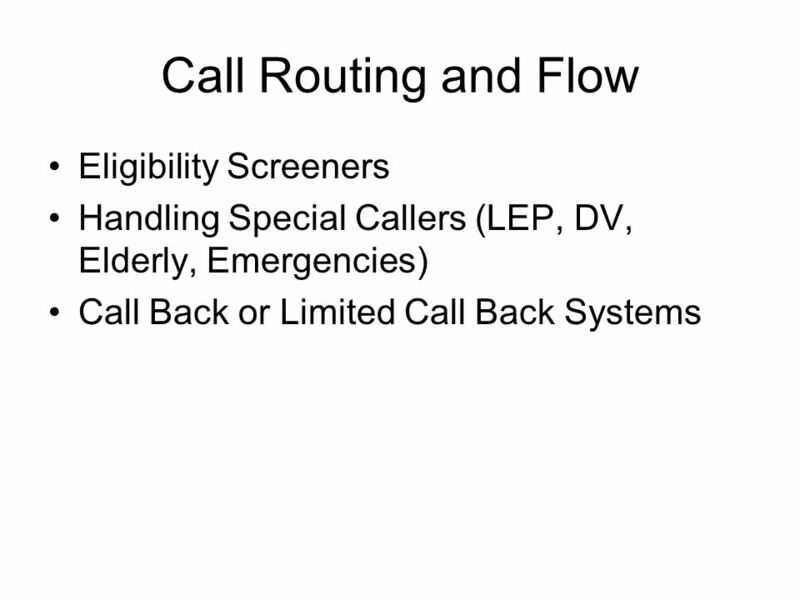 Ability to Link the Case Management System to our Phone System. Ability to Provide for Current or Future Opportunities for Video Conferencing between offices or other partner agencies. Telephone solutions should be integrated with our data systems, easily maintained, and cost effective. 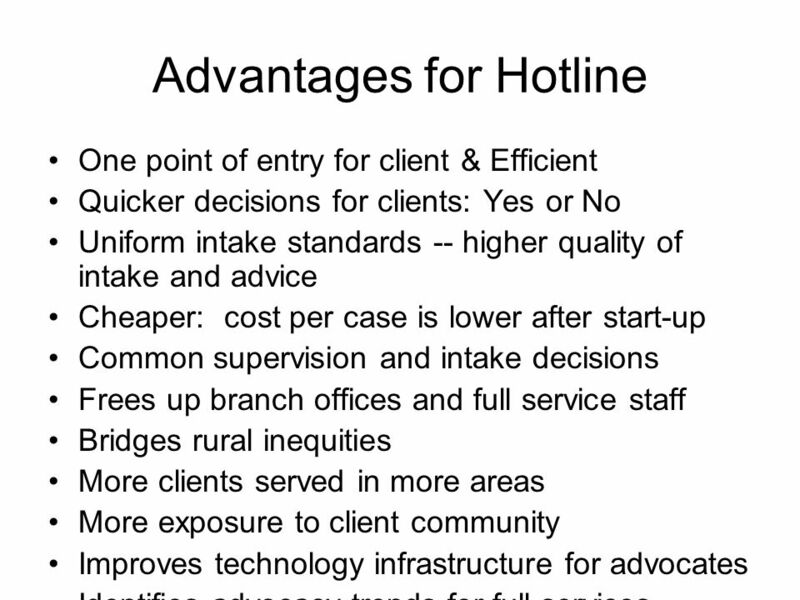 Inter-office calls should be free of charge, and long-distance charges should be below market rates. 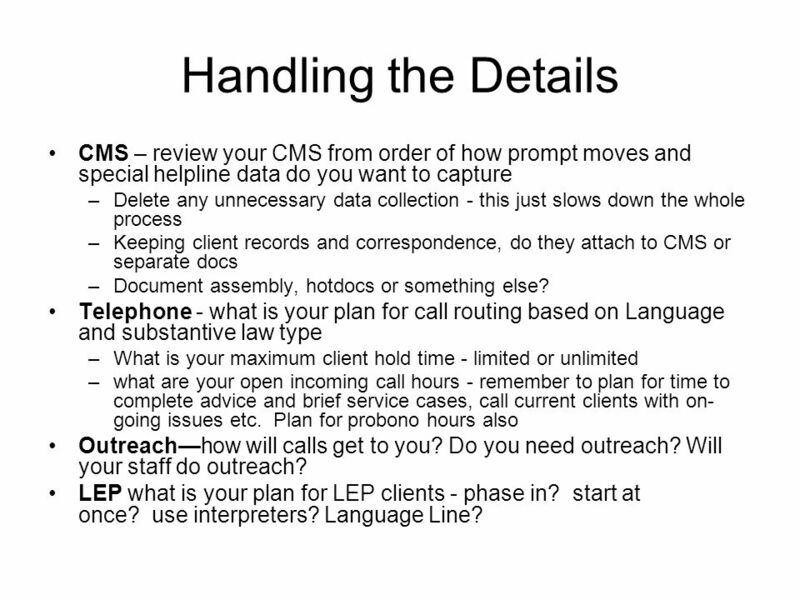 71 Handling the Details CMS – review your CMS from order of how prompt moves and special helpline data do you want to capture –Delete any unnecessary data collection - this just slows down the whole process –Keeping client records and correspondence, do they attach to CMS or separate docs –Document assembly, hotdocs or something else? 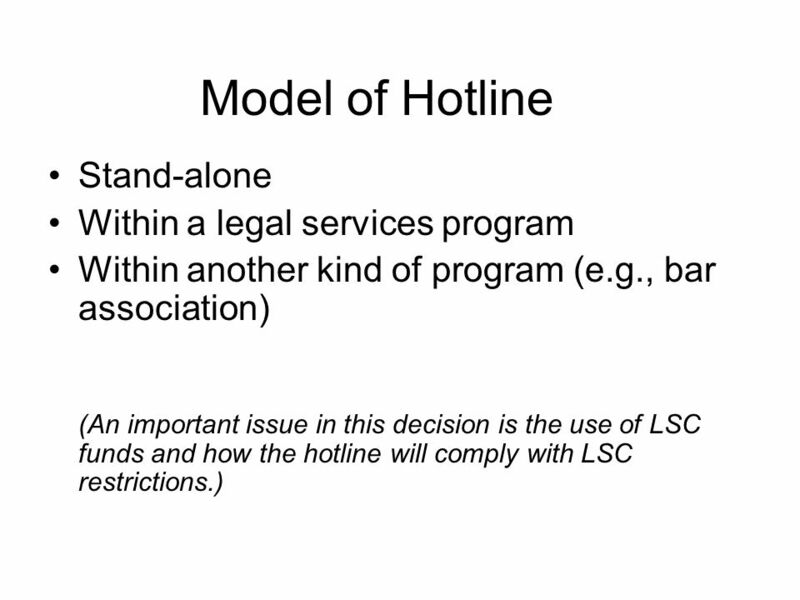 Telephone - what is your plan for call routing based on Language and substantive law type –What is your maximum client hold time - limited or unlimited –what are your open incoming call hours - remember to plan for time to complete advice and brief service cases, call current clients with on- going issues etc. 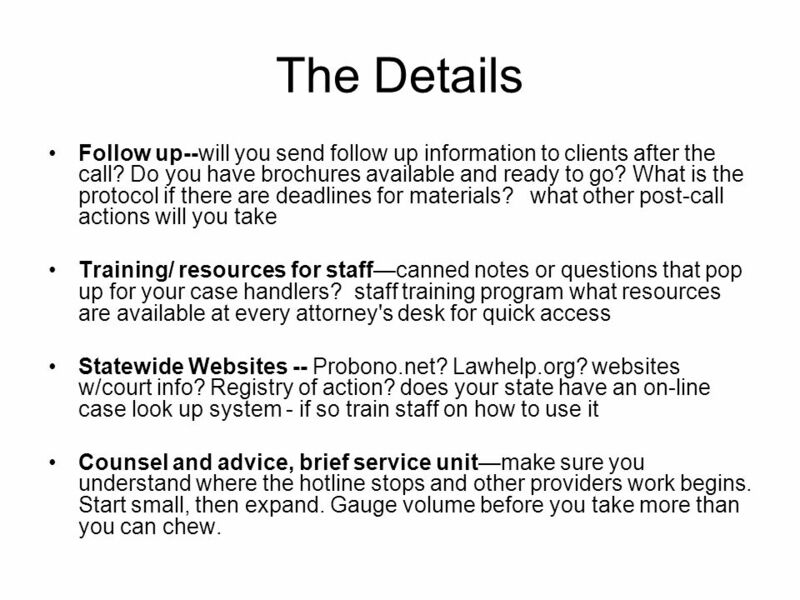 Plan for probono hours also Outreachhow will calls get to you? 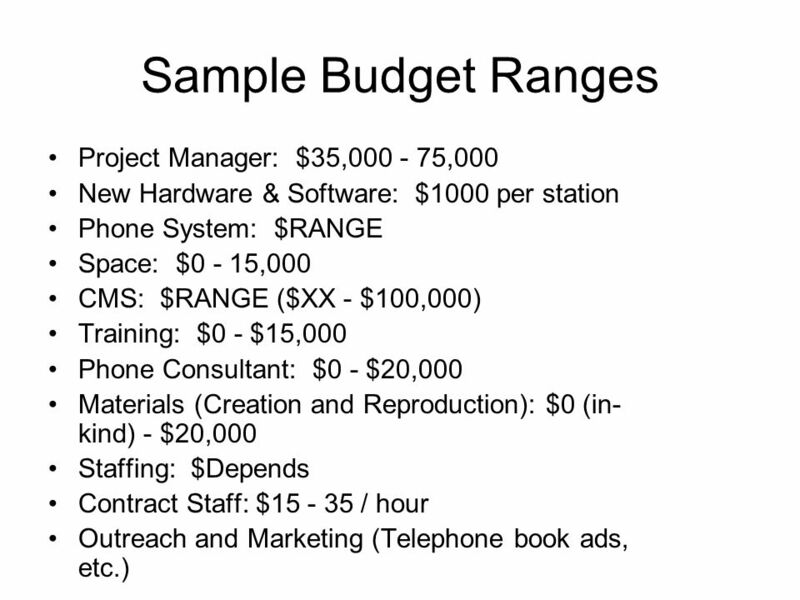 Do you need outreach? Will your staff do outreach? LEP what is your plan for LEP clients - phase in? start at once? use interpreters? Language Line? 72 The Details Follow up--will you send follow up information to clients after the call? Do you have brochures available and ready to go? What is the protocol if there are deadlines for materials? what other post-call actions will you take Training/ resources for staffcanned notes or questions that pop up for your case handlers? 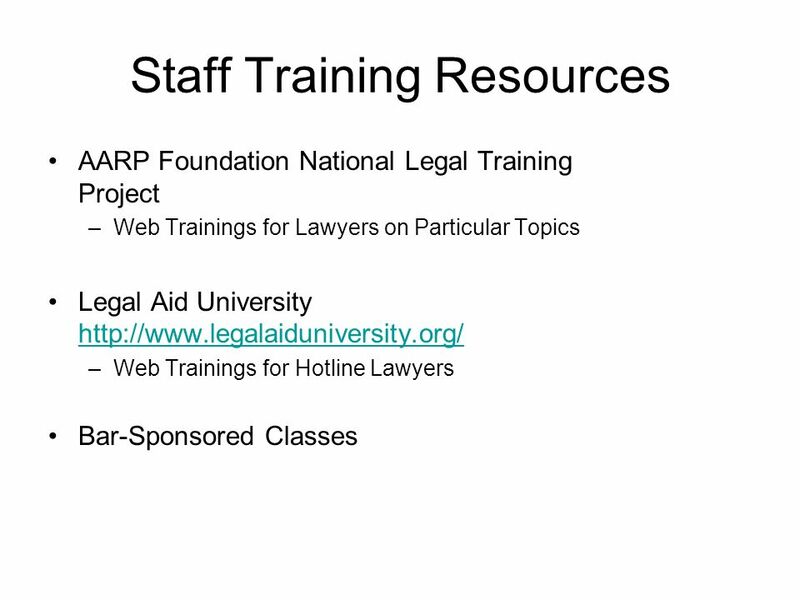 staff training program what resources are available at every attorney's desk for quick access Statewide Websites -- Probono.net? Lawhelp.org? websites w/court info? Registry of action? 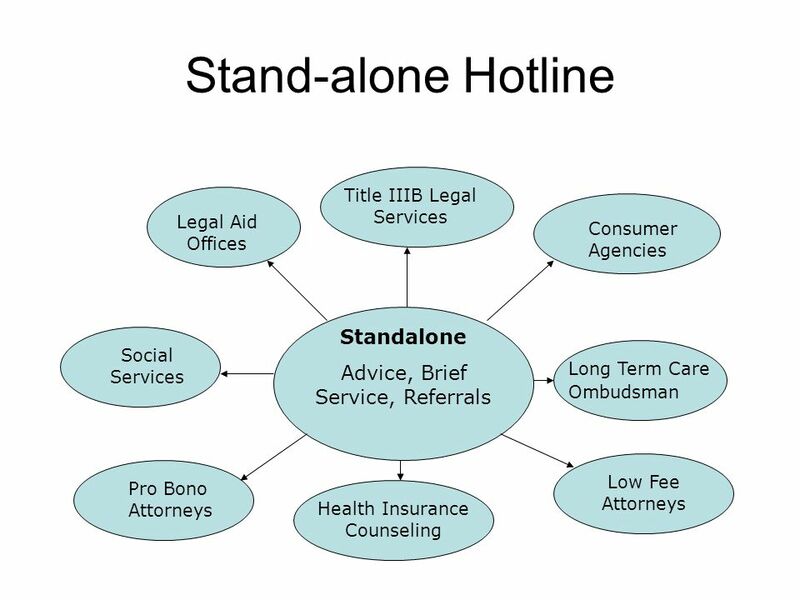 does your state have an on-line case look up system - if so train staff on how to use it Counsel and advice, brief service unitmake sure you understand where the hotline stops and other providers work begins. Start small, then expand. Gauge volume before you take more than you can chew. 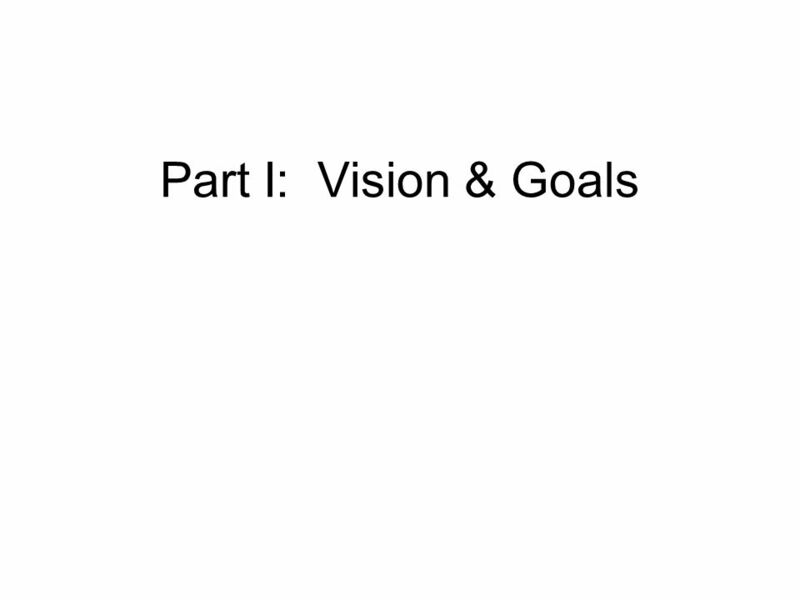 Download ppt "Part I: Vision & Goals. 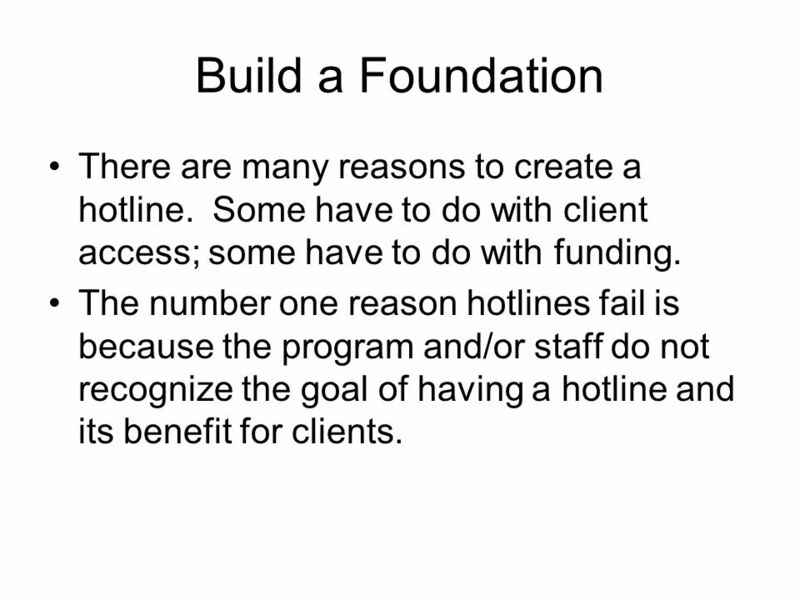 Build a Foundation There are many reasons to create a hotline. 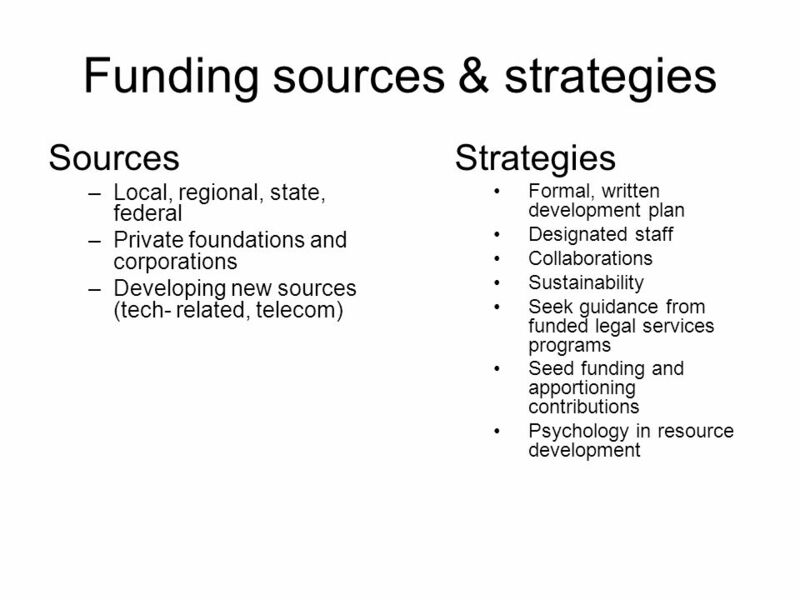 Some have to do with client access; some have to do with funding." Best Practices in Using Technology to Recruit and Support Pro Bono Lawyers Matthew Burnett Pro Bono Net Naceem Navidi LSNTAP. Information and Referral: Call Center Proposal Board of Early Education and Care December 8, 2009. NAEH Annual Conference 7/18/06 Volunteers Of America, Oregon Home Free1 Innovations in Domestic Violence Response: Creating New Options for Survivors Volunteers. 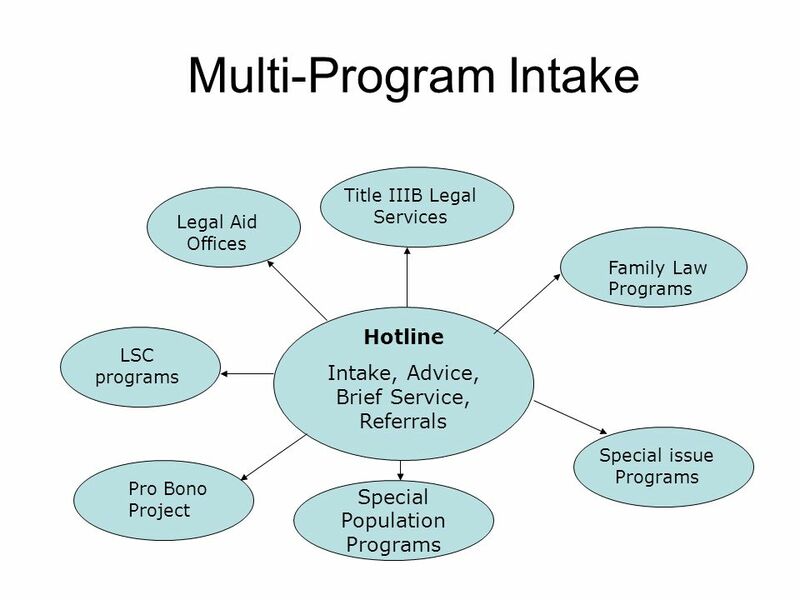 Building the Capacity for Justice System Innovation Bonnie Rose Hough Center for Families, Children & the Courts of the Administrative Office of the Courts. I. 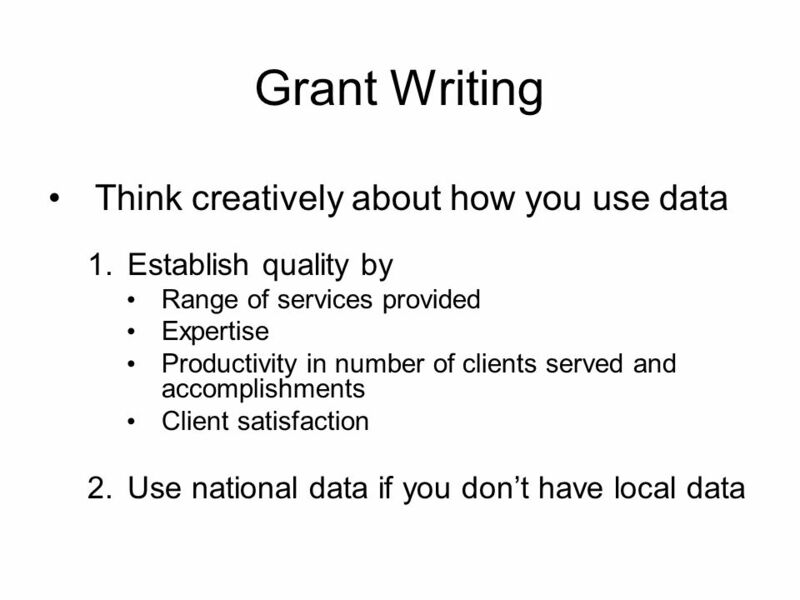 Why Proposals Do Get Funded Or Do Not Get Funded Why proposals do get funded –Tangible Reasons: Good Idea Well thought out program/well structured proposal. 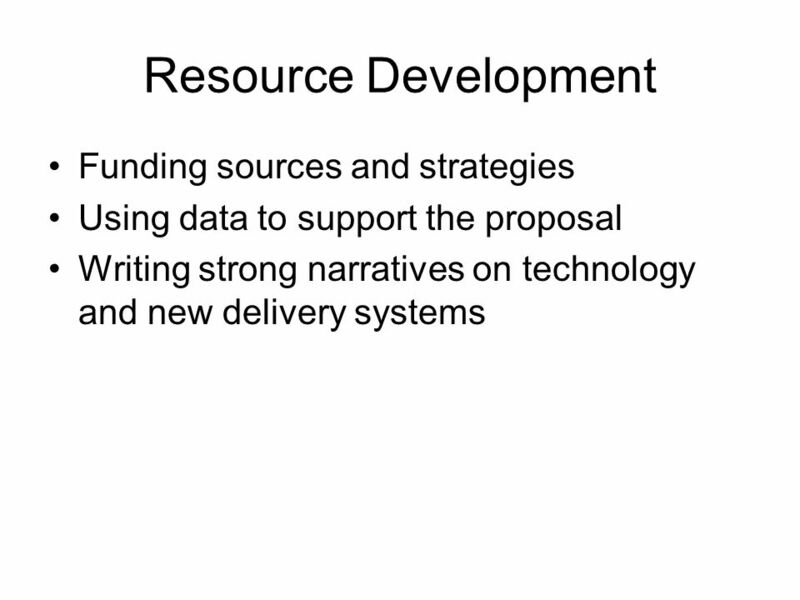 Welcome to the Business and Operational Planning for School-Based Health Centers RFP Workshop April 12, 2010.